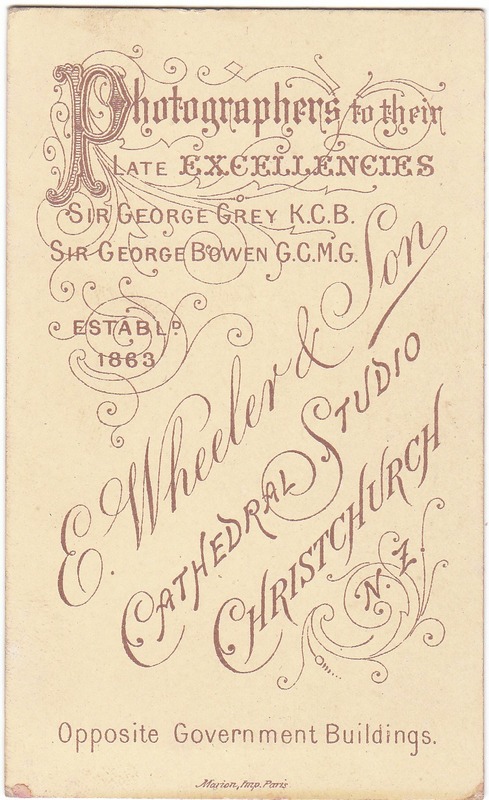 This studio was established in Christchurch late in 1863 or early 1864. 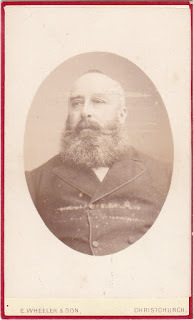 Edmund Wheeler was born in Ridgway or Inkberrow, Worcestershire about 1800 the son of Richard Wheeler and Sarah Rimmel, he was baptised on 9 May 1802 in Inkberrow, Worcestershire. 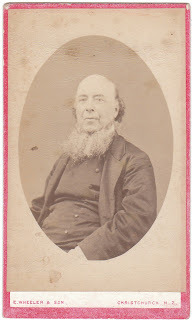 He married Esther Walker at Aston Juxta, Birmingham on 8 November 1837 (12). 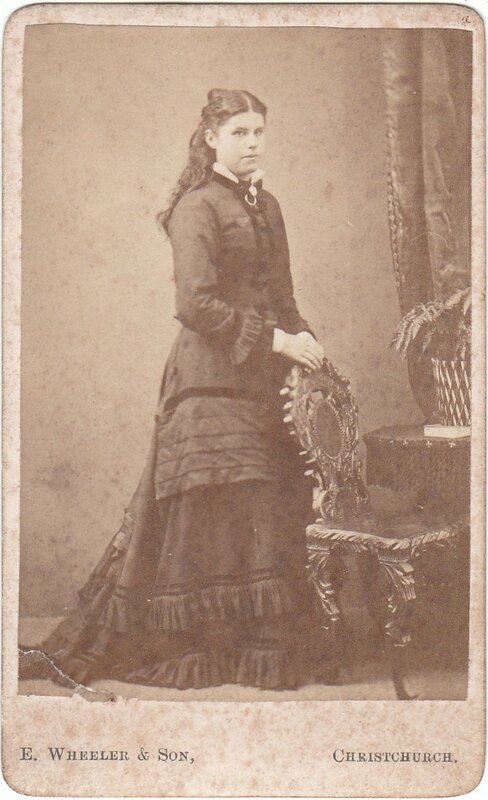 A daughter Sarah Ann was born in 1840 and a son Edmund Richard in 1842. 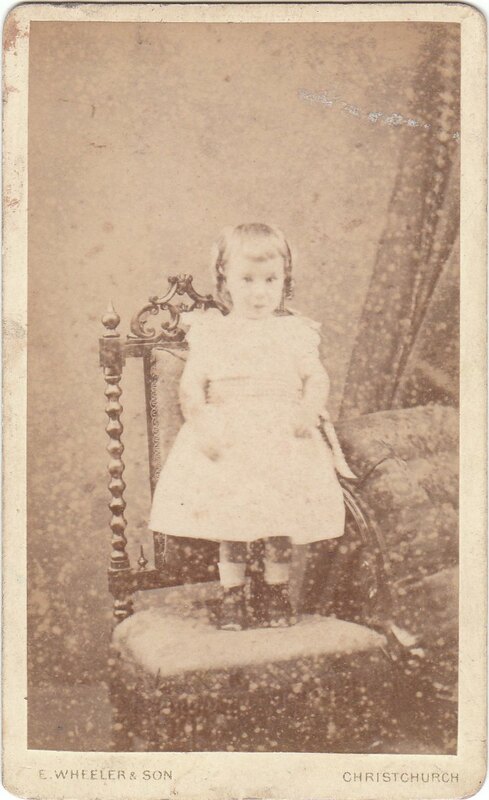 A second daughter Ellen Wheeler was born in 1845 but died soon after and was buried on 11 May 1845 in Saint Martin Parish, Birmingham (11). 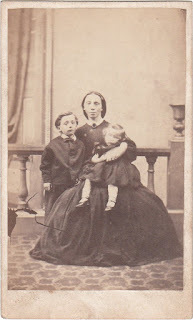 The 1851 census shows Edmund Wheeler aged 51 years employed as a maltester, living at 62 Bath Row, Birmingham with his wife Esther then aged 39 and daughter Sarah Ann aged 10 and son Edmund aged 8 years. 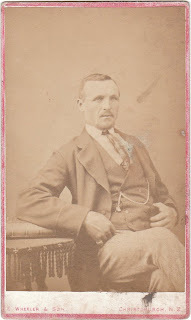 The 1861 census shows the family at 30 Bath Row, Edmund was then aged 61 years employed as a corn factor. 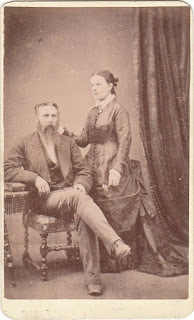 Edmund Wheeler aged about 63 years arrived in Lyttelton on the "Zambesi" on 20 September 1863 with his wife Esther, daughter Sarah Ann Wheeler and son Edmund Richard Wheeler. Already in New Zealand was Edmund's widowed sister Elizabeth Ashwin and her children Helen Ashwin, Marion Ashwin and Martin Richard Ashwin and his wife and children. 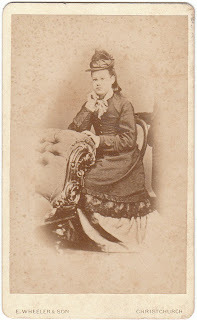 Edmund's niece, Sarah Elizabeth Wheeler, the daughter of his brother Richard Wheeler was also in New Zealand having arrived in Lyttelton in May 1863 on the "Sebastopol" with the Ashwin family. 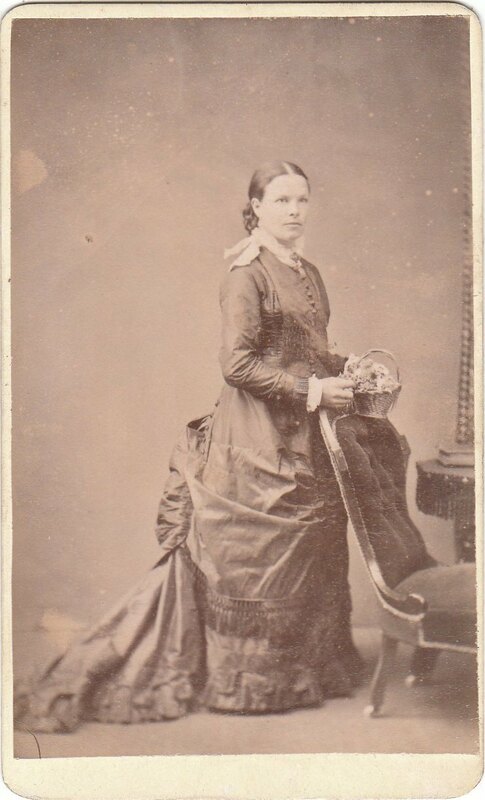 Sarah Elizabeth Wheeler was married in 1866 to Henry William Packer, they were the parents of the "Misses Packer, of Cranmer square" described as Edmund Richard Wheeler's relatives in his 1933 obituary. 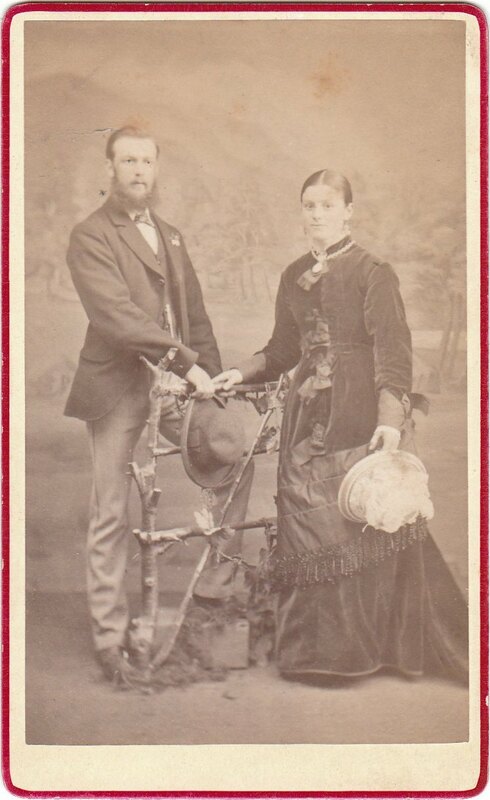 Later, relatives of Edmund's wife Esther Walker would also settle in New Zealand; Henry Christopher Lane and John Eustace Lane, the sons of Esther's sister or cousin Harriet Walker and John Lane of Broom Court, Warwickshire. Henry Christopher Lane is "Mr H. C. Lane of Spreydon" also mentioned in the 1933 obituary. 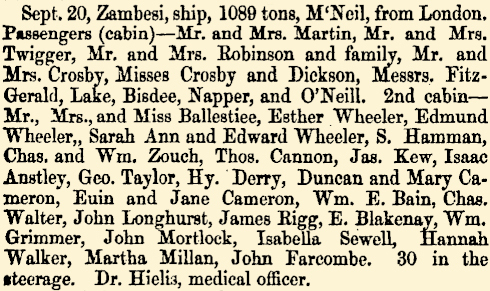 Esther Wheeler, Edmund Wheeler, Sarah Ann Wheeler and Edward (sic) Wheeler arrived at Lyttelton from London as second cabin passengers on the "Zambesi" on 20 September 1863. 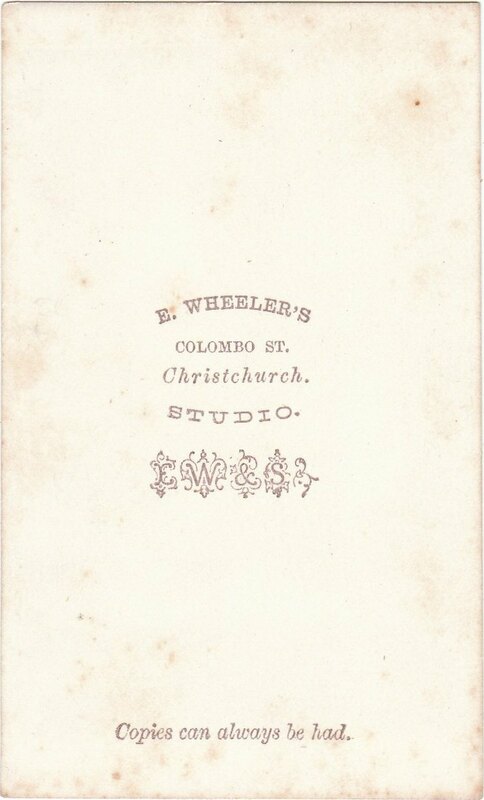 After his arrival Edmund Wheeler opened a subscription and circulating library in Cashel Street next door to the Bank of New Zealand he also sold fancy goods such as photo albums, stereoscopes and slides. 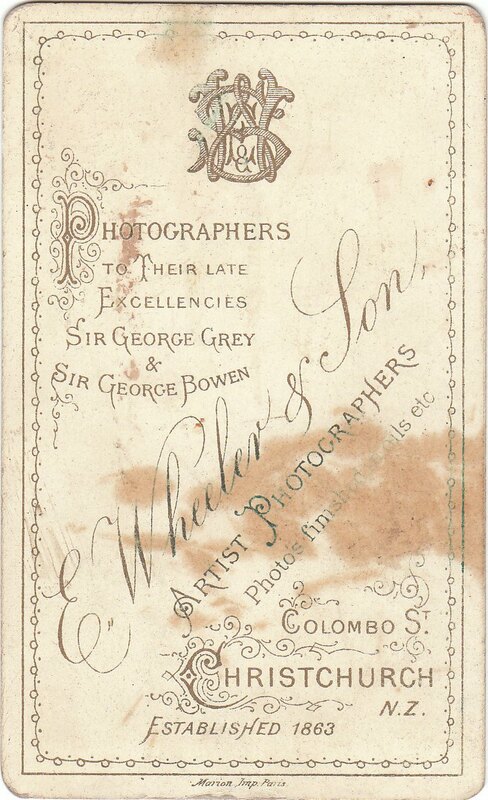 In January 1864 he first advertised as a photographer in Colombo Street, near Cashel Street. 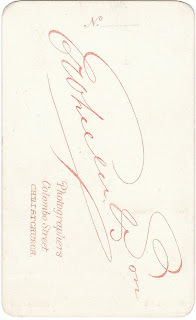 In later years he indicated on the reverse of his cartes de visite that the photographic studio was established in 1863. 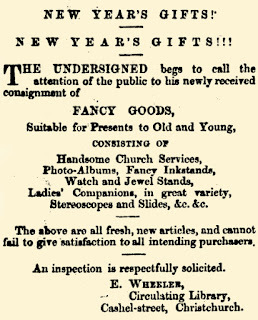 This notice first appeared in the Press on 18 January 1864. In June 1864 his photographic studio was one of a number dwellings and business premises destroyed by fire or pulled down to prevent the spread of fire along the western side of Colombo Street between Cashel Street and Cathedral Square. 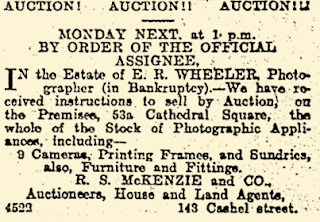 Wheeler was insured for £100 by the London ad Lancashire Insurance Company. 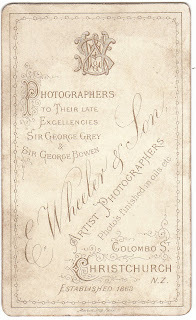 A portrait of Sir George Grey by E. Wheeler and Son. 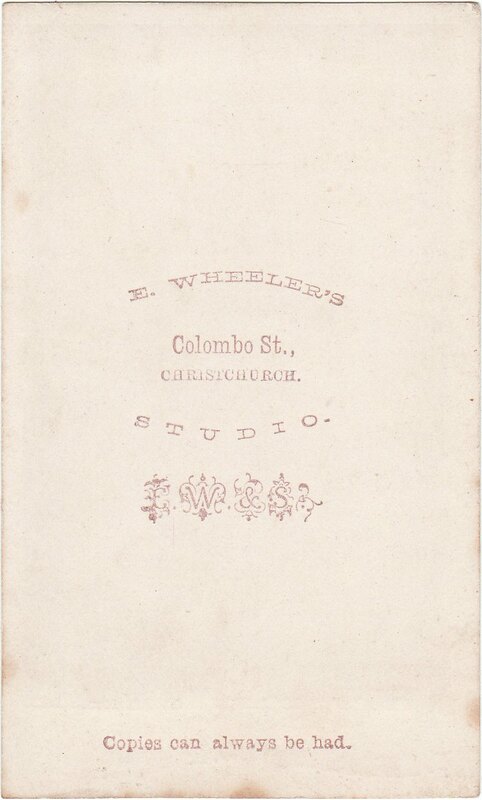 Edmund Wheeler died at his residence, Hereford Street East, Christchurch on Friday 19th October 1877 aged 77 years. 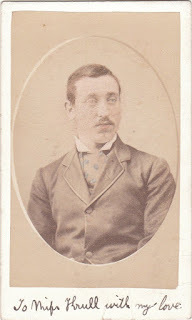 He was buried in the Barbadoes Street Cemetery. 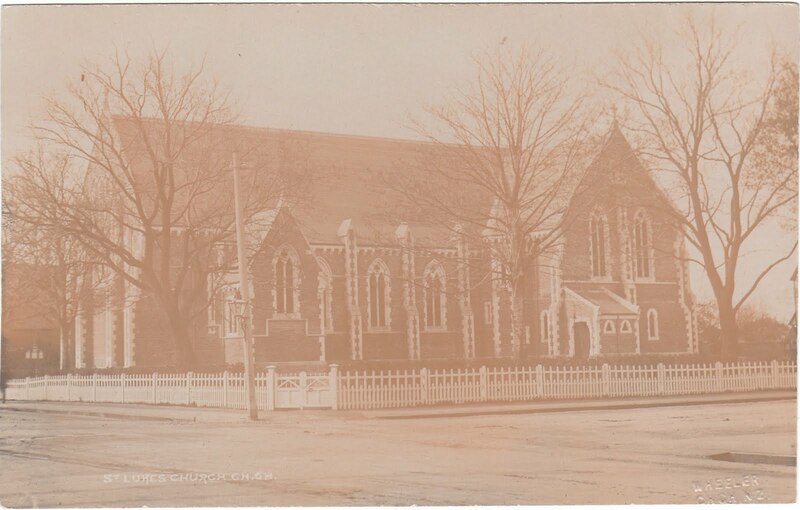 His wife Esther Wheeler died at her residence "The Hawthorns," Hereford Street, Linwood (9) on 2 February 1906 aged 91 years (BDM record, Dept of Internal Affairs). 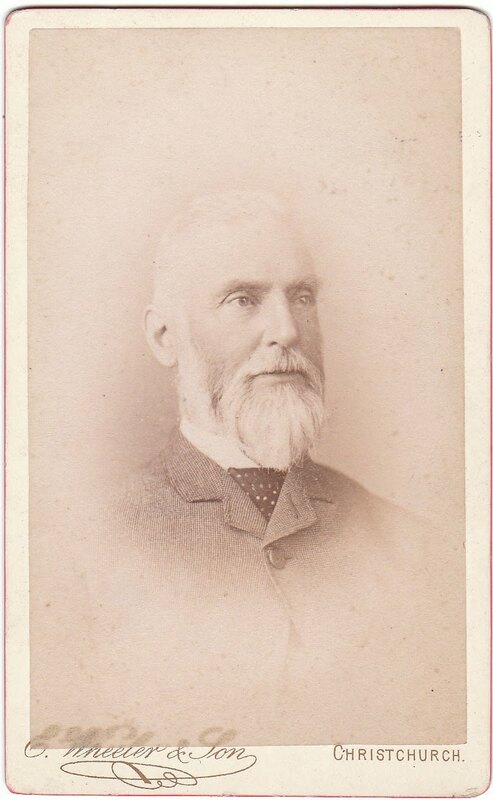 Edmund Richard Wheeler was born on 22 October 1842 in Birmingham, England (registered Dec 1842 Wheeller (sic) Edmund Richard, Aston vol. 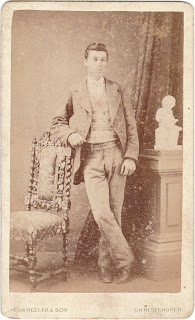 16 page 167) and baptised on 19 January 1848 at Saint Martins in Birmingham the son of Edmund and Esther Wheeler. 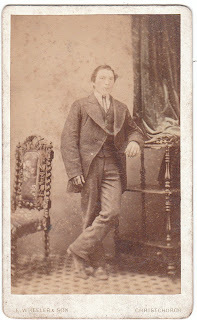 The 1861 census shows him at 30 Bath Row, Birmingham aged 18 employed as an apprentice merchant's clerk. 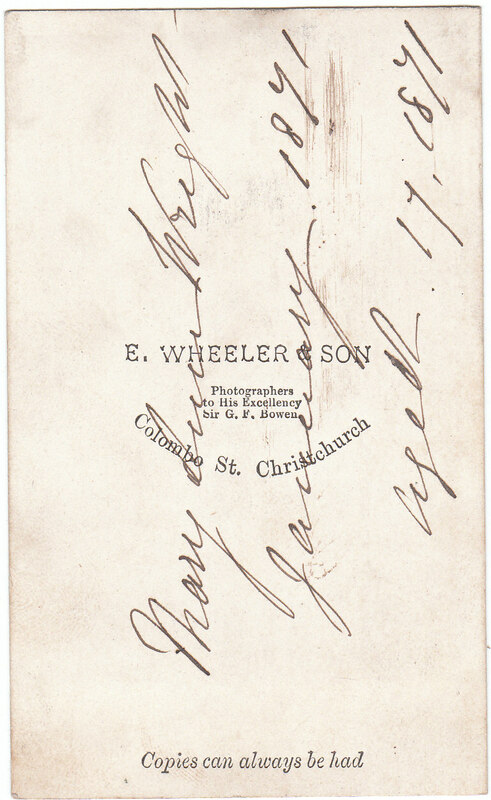 Edmund Wheeler aged 20 years arrived in Lyttelton on the "Zambesi" on 20 September 1863 with his parents and sister Sarah Ann Wheeler. 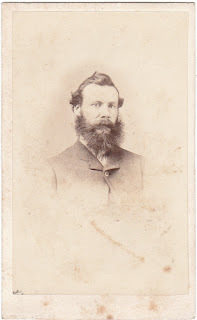 On Sunday afternoon Mr E. Wheeler had a narrow escape from a serious accident. While walking along the Sumner road, under the cliffs, he was knocked down by a motor-car. 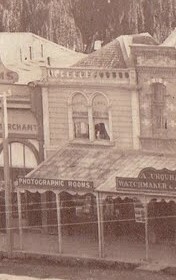 The car, which was occupied by several ladies, approached from behind, and Mr Wheeler failed to hear it. 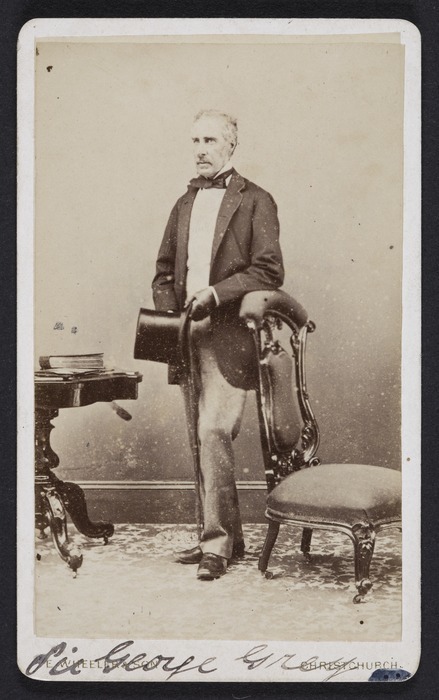 Mr Wheeler, who was severely bruised and cut about the hands and arms, was able to proceed to his home. 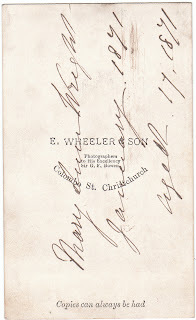 Edmund Richard Wheeler died on 16 January 1933 aged 90 years, he was living at that time at 8 Stoke Street, Christchurch. 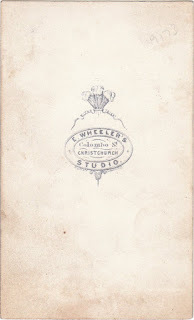 The death of Mr Edmund Richard Wheeler, of Stoke Cottage, Sumner, which occurred on Monday at the age of 90, has deprived Christchurch of an old and talented resident. 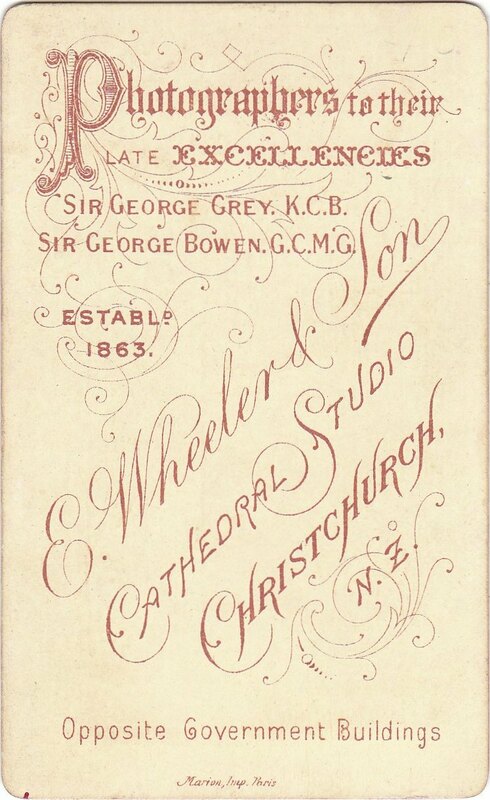 It was as a young man of twenty years that Mr Wheeler, accompanied by his father and mother, came to Christchurch in 1863 from Gloucestershire, where he had been born on October 27, 1842. 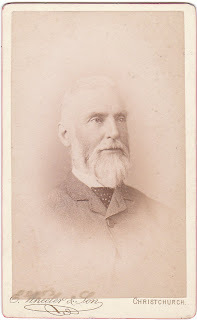 His family lived in Birmingham for many years, and Mr Wheeler received his education at the King Edward Grammar School there. He was dux of the school and an outstanding student of Greek, Latin, and French. 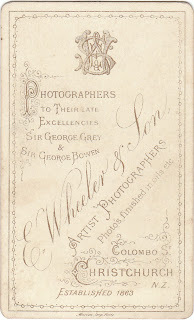 He had applied himself to photography, before leaving England, and not long after his arrival in Canterbury he opened a photographic studio, becoming well known for his scenic studies. 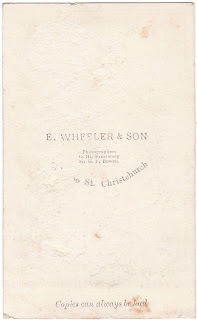 In 1894 he published two volumes of New Zealand scenery entitled "The Imperial Album of New Zealand Scenery." 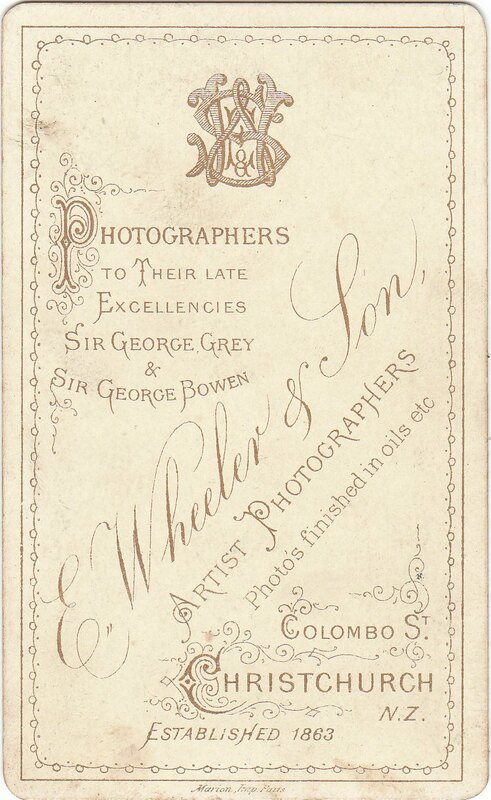 But photography was by no means Mr Wheeler's only accomplishment. 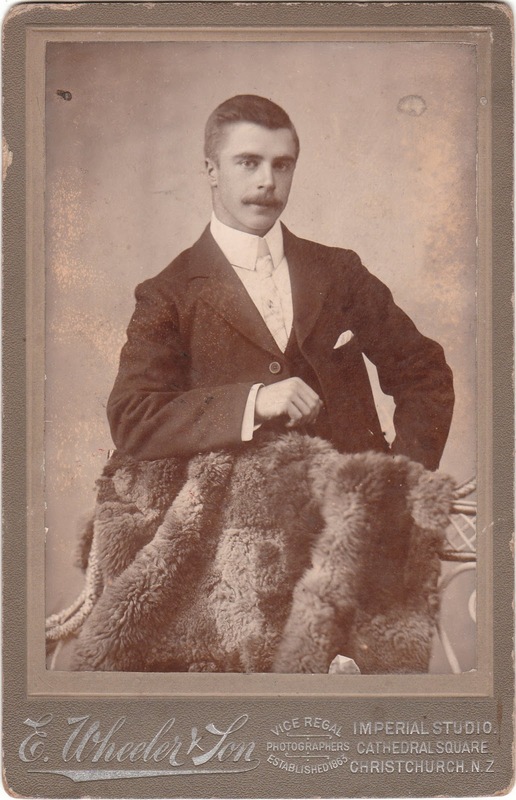 Profiting from his school studies under Edwin Arnold (later Sir Edwin Arnold), author of "The Light of Asia," he was deeply interested in books, and boasted a very fine collection. 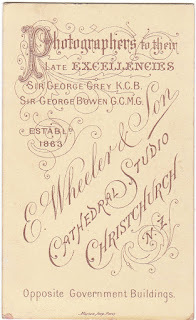 For a long period Mr Wheeler conducted the book reviewing column of the "Christchurch Times," and continued until quite lately to contribute reviews. A few years ago he published "The Cabinet Secret," a collection of short stories, and was engaged on literary work quite recently. He was also an old member of the Royal Musical Society. Accompanied by his only sister, Miss Wheeler, who is now in her ninety fourth year, Mr Wheeler moved to Sumner about 20 years ago, and his home was marked by a wonderful display of plants and flowers. 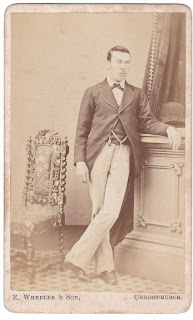 His broad culture and attractive personality gained him a wide circle of friends by whom his death will be mourned. 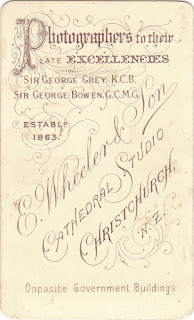 Mr Wheeler is survived by Miss Wheeler, his only other relatives being the Misses Packer, of Cranmer square, and Mr H. C. Lane [Henry Christopher Lane] of Spreydon. 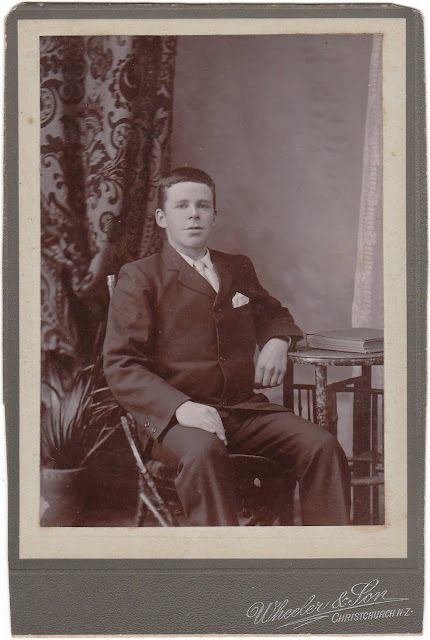 Intimate friends attended the funeral of Mr Edmund Richard Wheeler, which left "Stoke Cottage," Stoke street, Sumner, yesterday afternoon for the Bromley Cemetery. Archbishop Julius conducted the services at the house and at the graveside. 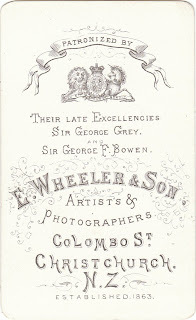 The chief mourners were Messrs H. C. Lane and D. A. Lane. Wreaths were sent by Mr and Mrs Barton and Cranleigh [Cranleigh Harper Barton, 1890-1975], Florence Jones, Mrs R. Chapman, Mr and Mrs H. C. Lane and Douglas, Mrs G. C. Z. Harris, Mrs Gebbie and family, and Mrs D. Syme. 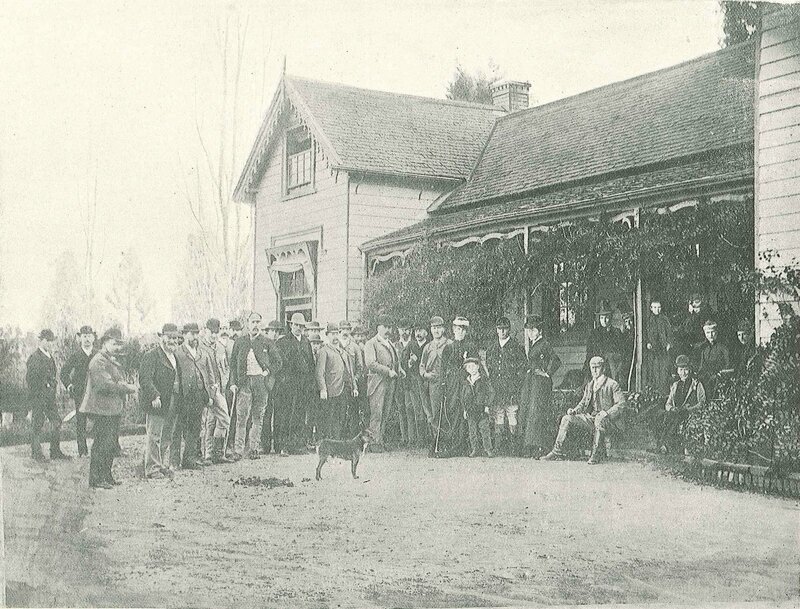 Among those present were Messrs E. G. Wood, E. A. Barton, Cranleigh H. Barton, F. M. Voice, A. E. Preece, F. H. Labatt, J. S. Young, W. H. Brown, G. Gerard, D. L. Gebbie, Steffano Webb, Lloyd Brian, and A. P. Osborne. above - the headstone of Edmund Richard Wheeler and his sister Sarah Ann Wheeler in Bromley Cemetery, Christchurch (block 10, plot 31). 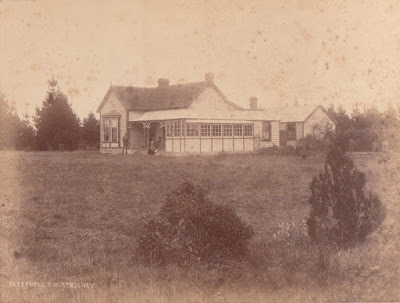 On Friday [23 June 1933] Miss Sarah Wheeler celebrated the ninety-fourth anniversary of her birthday [23 June 1840], and many friends called at her home, "Stoke Cottage," Sumner, to offer their congratulations and to wish her happiness. 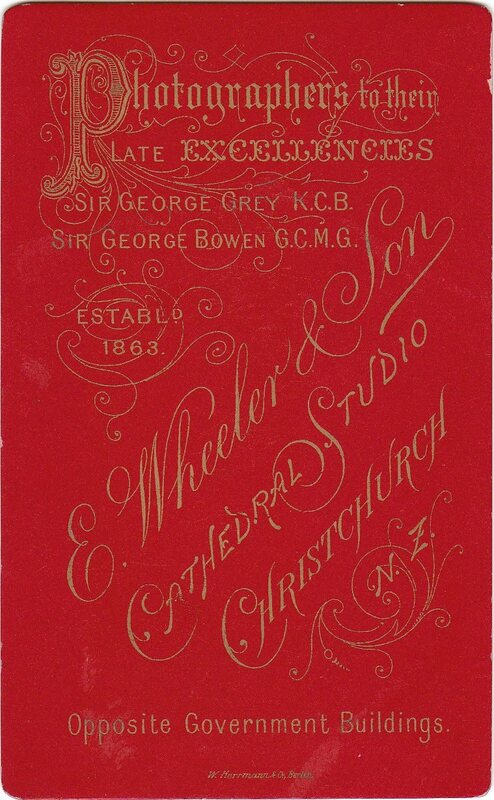 Miss Wheeler, who was born in Birmingham, came to Christchurch more than 70 years ago with her father and mother. 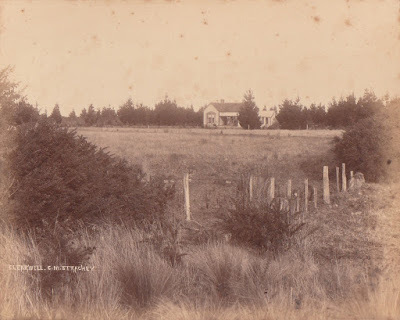 Her first home was in Christchurch on the old Windmill road. Later with her family she moved to the "Hawthorns," Hereford street, in the wilds of what is now Linwood. 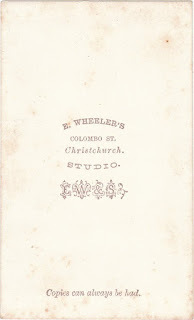 Mr E. R. Wheeler, well known in Christchurch literary circles, whose death occurred early this year, was a brother, and the home at "Hawthorns" was one of the artistic and cultural centres of the city in the early days. 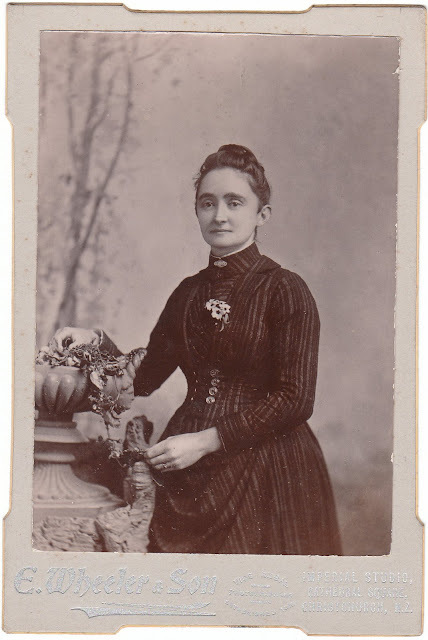 For the last 17 years Miss Wheeler has lived at Sumner. About 20 years ago she lost her sight, and had to abandon the fine needlework and painting in which she was skilled. 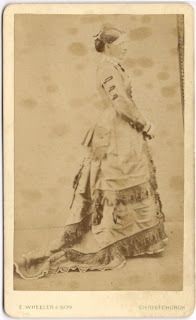 She is, however, an accomplished musician, and derives much pleasure from her singing, playing, and improvising. 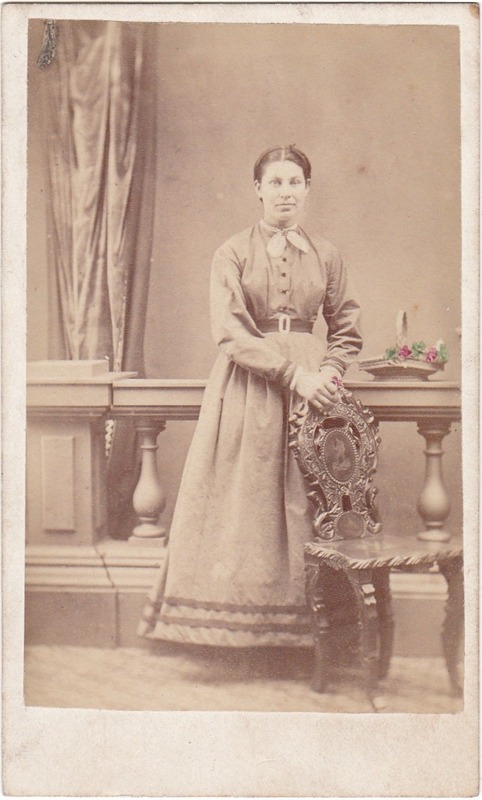 She was a member of the old Musical Union, now the Royal Christchurch Musical Society, and missed only one concert during 40 years. 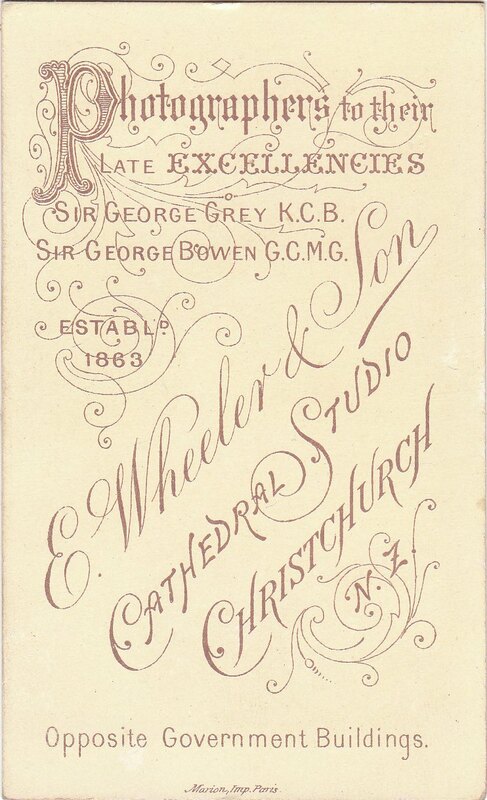 The claim to having been the first person after Archbishop Julius to see Christchurch from the top of the Cathedral spire was made yesterday Miss Wheeler, of Sumner, when interviewed by a representative of “The Press." Miss Wheeler is 96 years of age to-day. 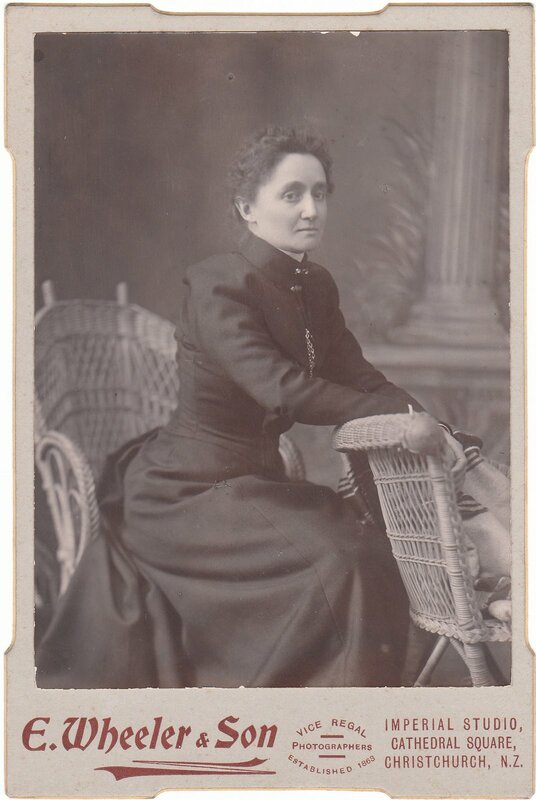 She said that she ascended in a basket and that Bishop (later Archbishop) Julius went up before her to give her courage when she reached the top. 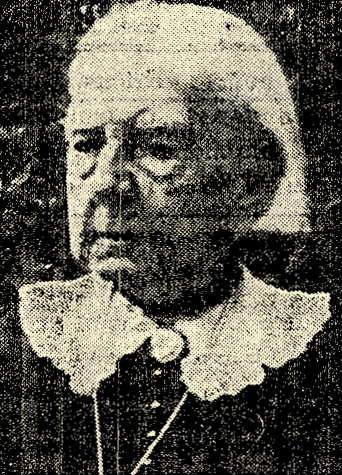 Miss Sarah Ann Wheeler, of “Stoke Cottage," Sumner, died yesterday in her ninety-seventh year. 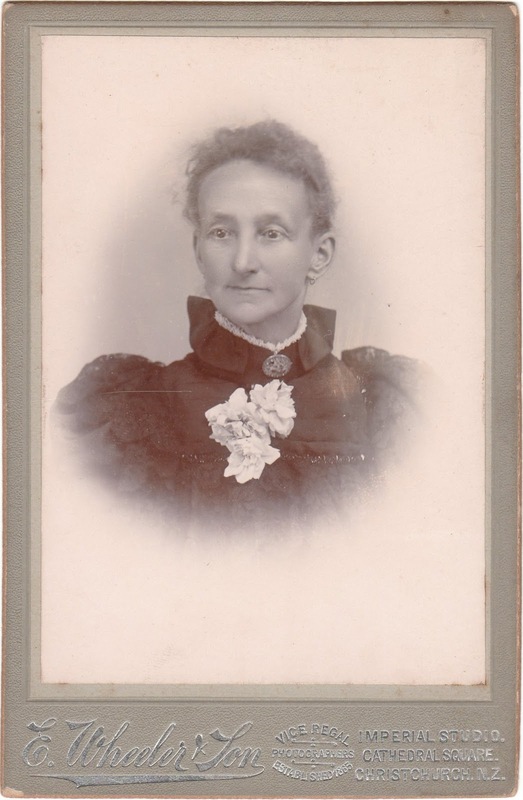 She was born at Birmingham, England, in 1840, and would have attained her ninety-eighth birthday tomorrow. With her parents and her brother she came to New Zealand in 1863 on the last passenger sailing vessel “Zambesi,” and celebrated her twenty-third birthday on board. 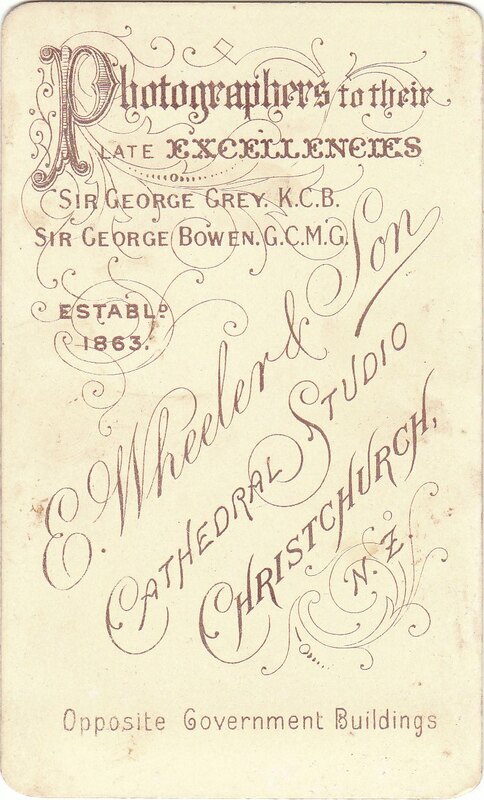 The family landed at Lyttelton, whence they made their way to Christchurch on foot, settling temporarily in the Avonside district. 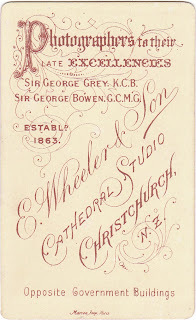 Later they built a house in Hereford street, and in 1914 Miss Wheeler and her brother went to Sumner, where they became well known and respected residents. Miss Wheeler’s eyesight began to fail when she was 50, and she has been blind for the last 10 years, but she was in full possession of her other faculties up to the time of her death, and she had a wide variety of Interests. 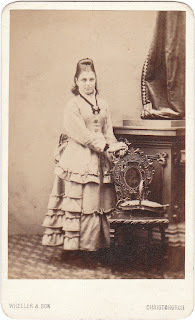 She derived her chief pleasure from music, and played the piano up till about two years ago. 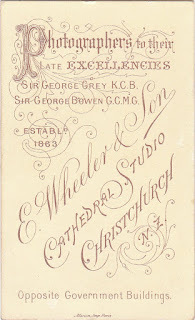 She was for years an enthusiastic member of the Christchurch Musical Society, and on her last birthday she was delighted to receive, a letter of congratulation from the society. 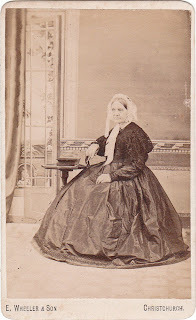 Her other interests lay in painting and needlework. 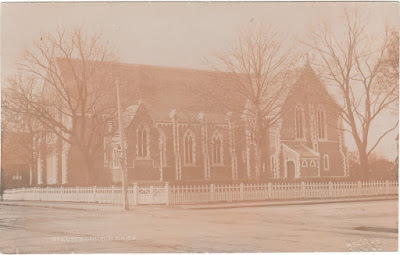 She was also very interested in church work, and when a resident of Christchurch attended the Anglican Cathedral, and later attended All Saints' Church, Sumner. The funeral will be held to-morrow. 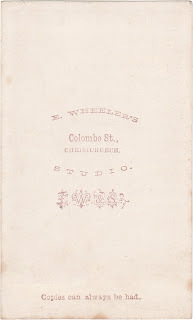 Wheeler's studio in Colombo Street. 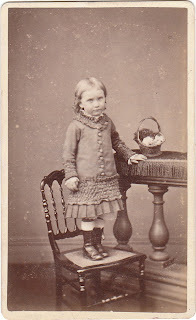 My Muse will have to stop at the beginning. But that they are to me the deepest mystery. Culled their sweet flowers, and sipp’d their dewy potions. To fair Titania's will I owe existence. To do the work—’Twas done as she had said. The curious parts in one fair whole they fixed. This beauteous thing from the rude glass did call. Who could to glass like strength and grace impart. Wheeler's studio in Cathedral Square. 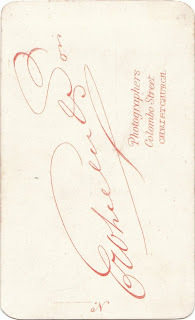 To Photographers. Wanted, an experienced Operator for a short time. Remunerative wages. 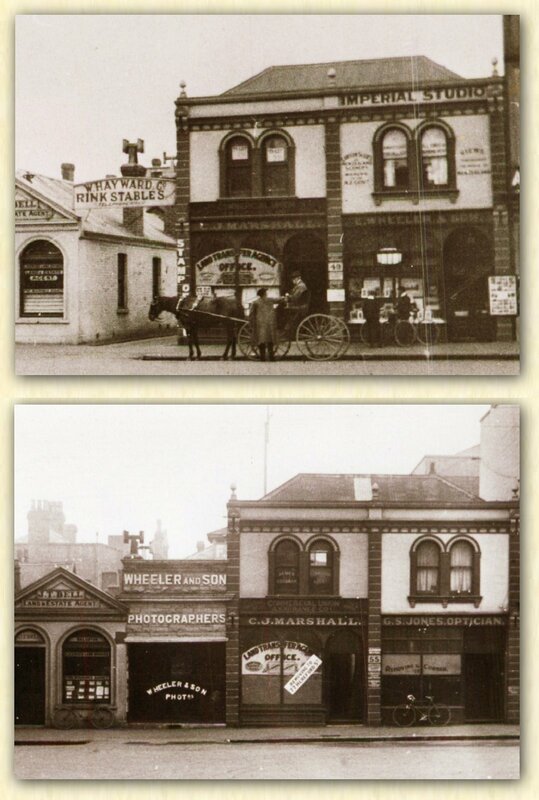 Apply to Mr Wheeler, "The Hawthorns," Hereford street east. 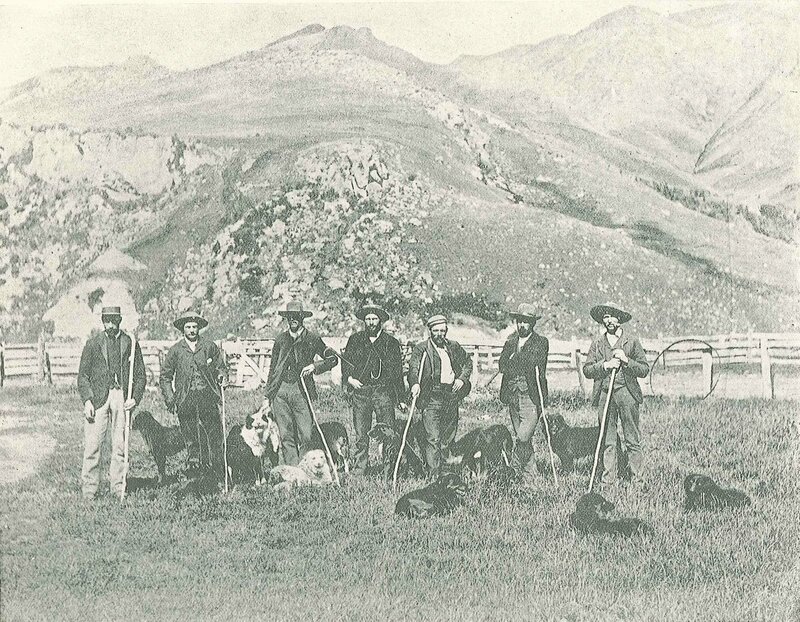 Lyttelton Harbour Works. The Provincial Government have called in the aid of photography in a novel and most interesting manner, and it may be added with complete success, so as to save time and labour, and consequently money. 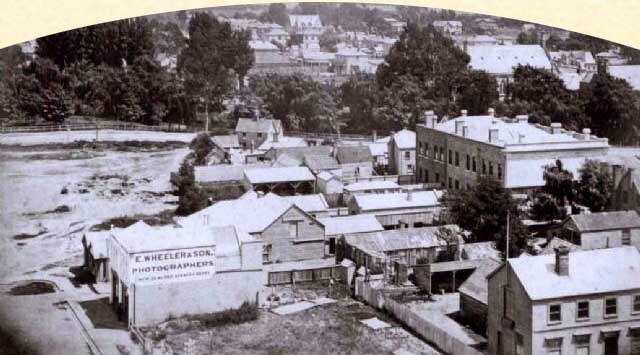 The plans recently prepared by the Provincial Engineer for the proposed large extension of the harbour works, which were fully explained in these columns a short time back in detail, have been photographed by direction of the Secretary for Public Works, he having had an application from a gentleman for copies of them to forward to Melbourne to a contractor there. 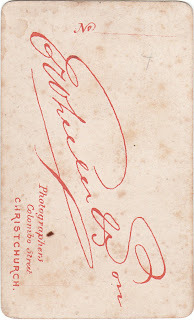 There not being sufficient time to have them copied by hand in the usual way, the aid of photography was invoked. 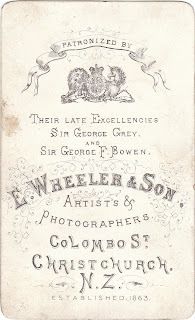 The photographs have been taken by Mr Wheeler, of Colombo street, and are very clear. The minutest figures can be clearly read by the aid of a magnifying glass. 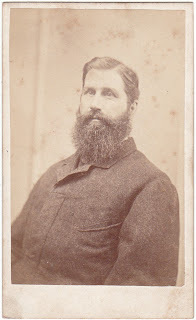 It is the intention of the Government to forward copies to Sydney also. 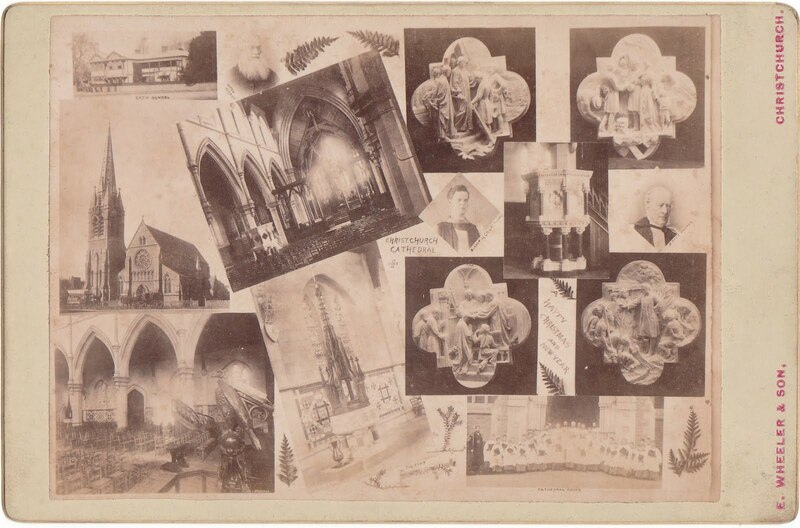 Albums suitable for views are kept in stock, and photographs bought will be mounted in them and lettered free of charge if required. The Napier photographers Hawley and Cole claimed in 1893 that their photographer Mr Wardley [Joshua Wardley 1826-1910] was for over five years the chief landscape photographer to Messrs Wheeler and Son, Christchurch. All outdoor work, interiors etc would be executed by Mr Wardley. 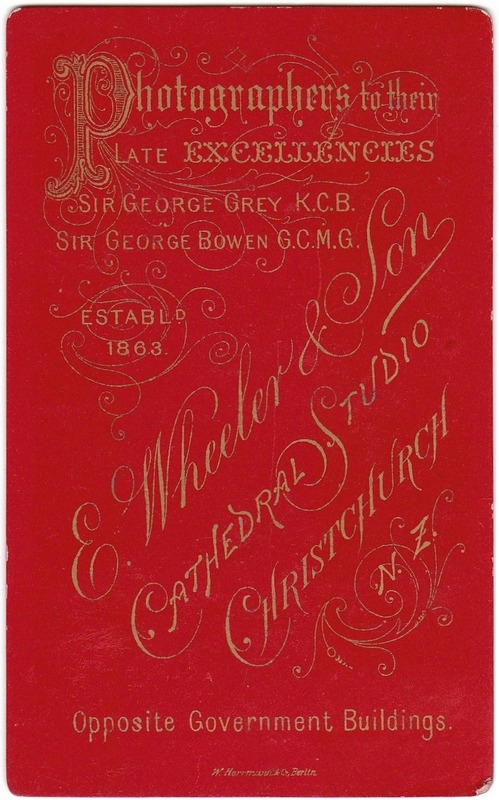 A handsome three-storey brick building is in course of erection in Cathedral Square for Messrs. Wheeler and Son, next to their present premises. 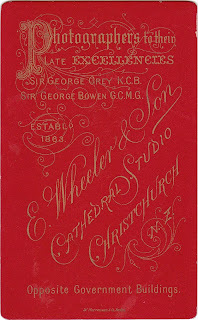 The 1882 Exhibition - Season tickets are now obtainable at the Exhibition offices. 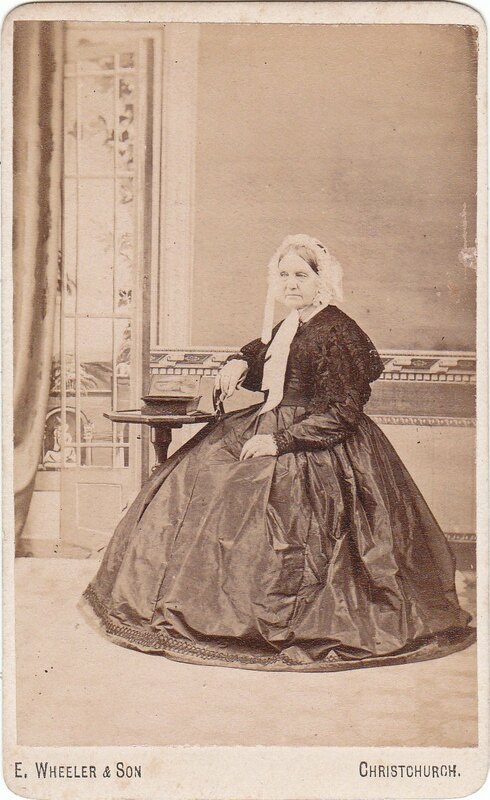 They consist, as I said in my last letter, of a signed form, attached to the "carte de visite" photo, of the holder. 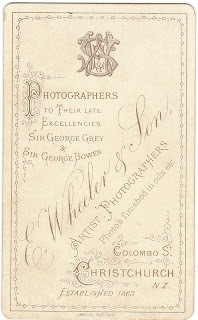 Messrs. Wheeler and Son have arranged with the promoters to supply two of these photos, for the sum of 2s. 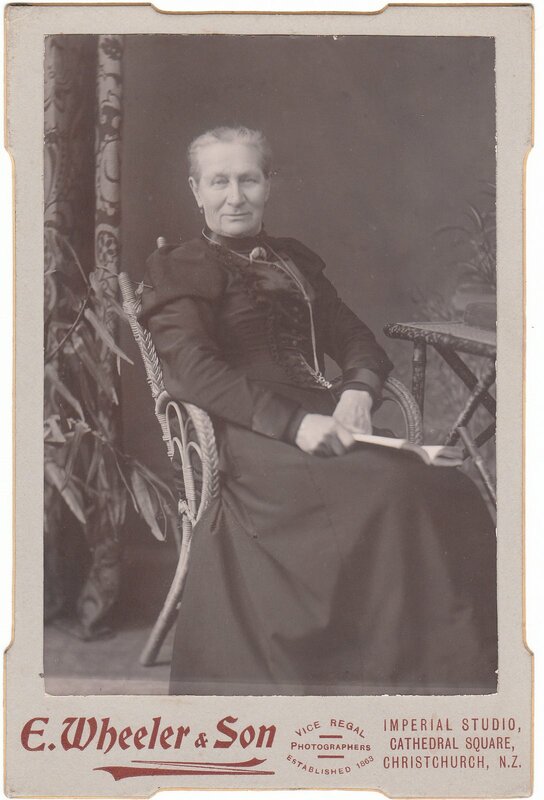 Gd. But here a difficulty may occur. 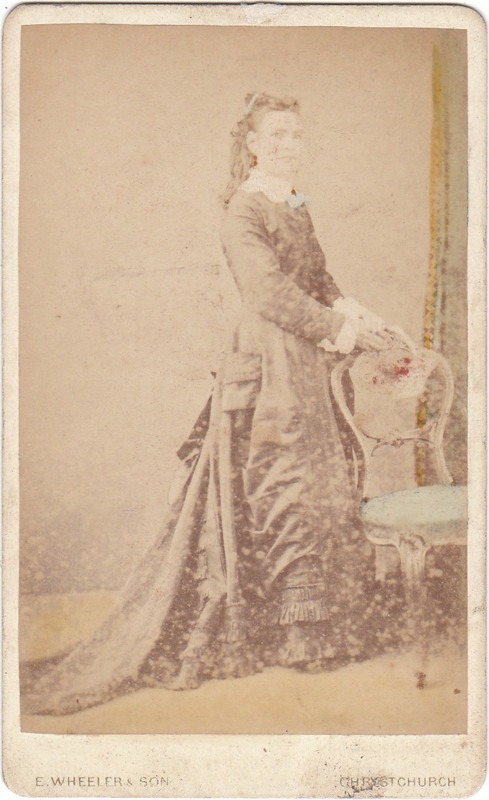 Many persons have the greatest possible dislike to have their likenesses taken; in fact, some never will consent, under any circumstances ; what is to be done in cases of this nature? 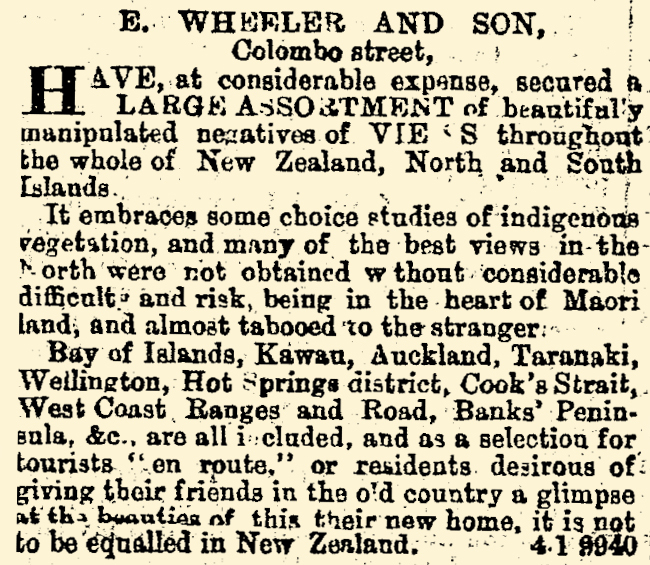 New Zealand Tablet, Volume IX, Issue 467, 24 March 1882, Page 11. 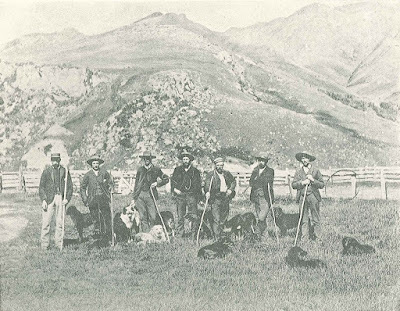 Photo above - Ulrich Kaufmann, Reverend William Green and Emil Boss - Otago Witness, Issue 2130, 20 December 1894, Page 20. 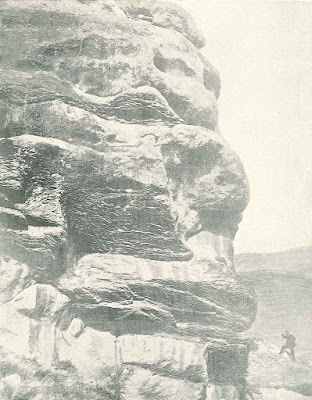 This photograph also appears in New Zealand Explorers - Great Journeys of Discovery, Philip Temple 1985, page 185, but the photographer is shown as Guy Mannering. 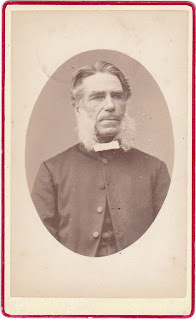 Portraits of Rev. 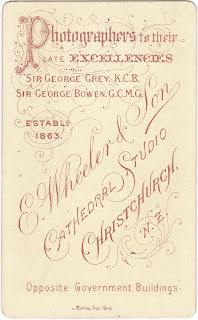 W. P. Green (sic) and his two Swiss guides, in climbing attire, can be obtained at the studio of the undersigned, those gentlemen having favoured Messrs Wheeler with a sitting. Cabinet size, 2s 6d each. 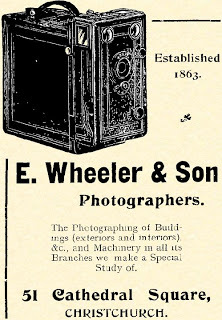 E. Wheeler and Son, Cathedral square. March 15, 1882. Star, 16 March 1882, Page 1.
above: Clearwell, near Mayfield, Canterbury, the farm of Claude Mainwaring Strachey by E. Wheeler & Son, Photographers, Cathedral Square, Christchurch. 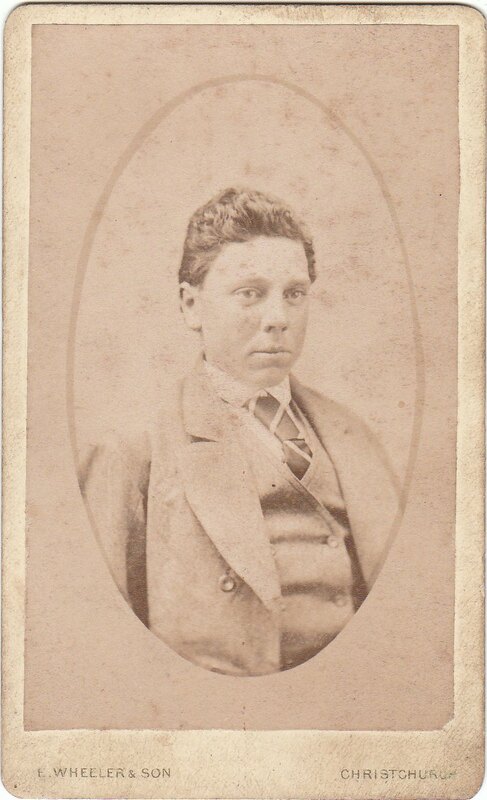 Edmund Wheeler, photographer, was charged with employing two young persons after 2 p.m. on Saturday last. 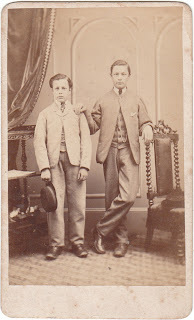 The Inspector under the Act said he had found two boys with aprons on; he understood from defendant that the boys were printing photographs. 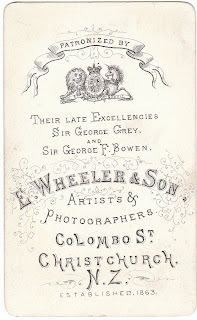 Mr Wheeler now said that the boys were employed as messengers and were simply doing a bit of cleaning up when the Inspector called. 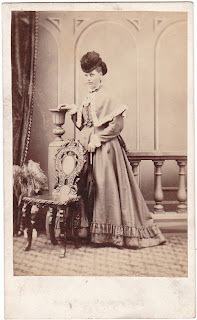 The Bench advised Mr Wheeler to read the Act, and have a notice of the hours of labour posted in his workroom. The present information was dismissed. 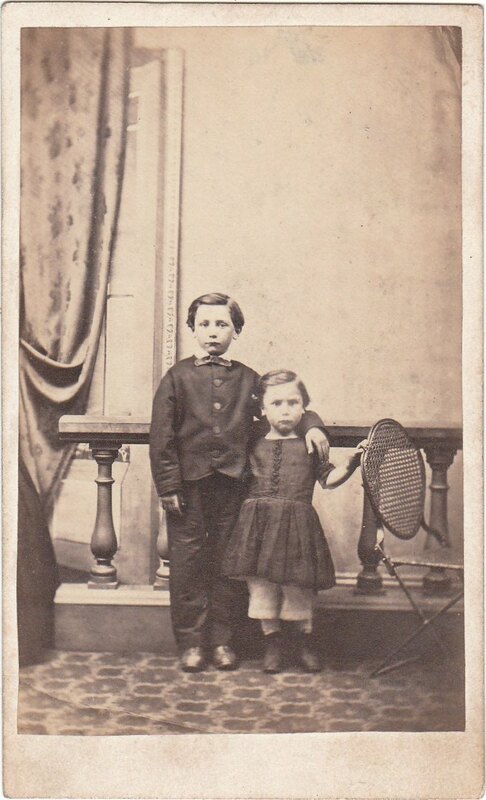 Christmas greetings to friends at Home will, of course, be forwarded even more numerously than in former years; and "Christmas cards" will, once more, be in universal request. The question arises, can anything that is at once novel and appropriate be obtained? 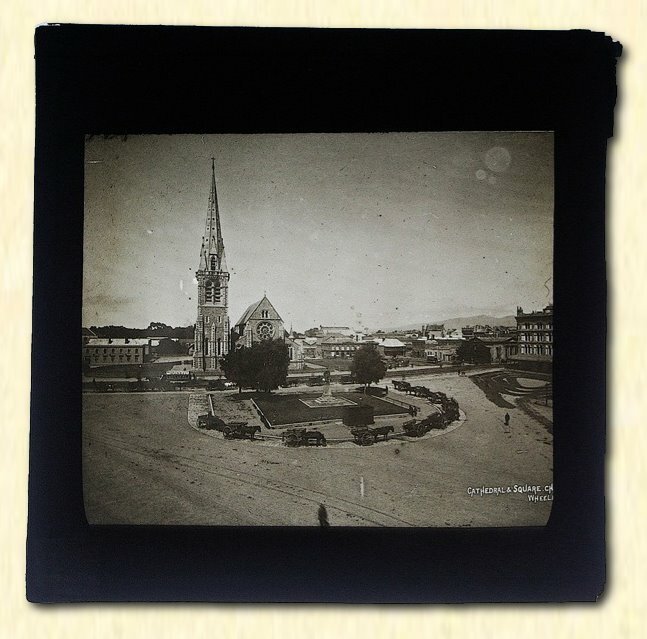 For answer, we recommend our readers to examine the series of photographic picture-groups just issued by Messrs E. Wheeler and Son, of Cathedral square. 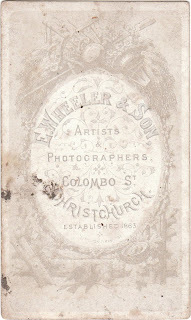 Their plan has been, to select suitable groups of their now well-known series of illustrations of New Zealand scenery, and to combine each group into one card-picture of cabinet size. 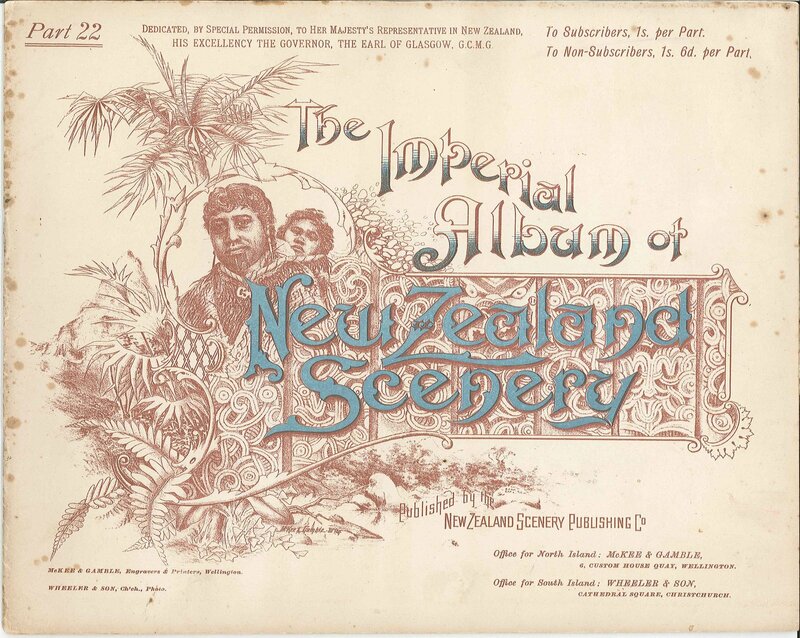 Tastefully arranged borders, &c, serve to produce a charming effect, and some happily conceived titles have been selected, such as "Christchurch, the City of the Plains;" "Under the Southern Cross;" "The Land of the Golden Fleece;" "Glimpses of New Zealand." 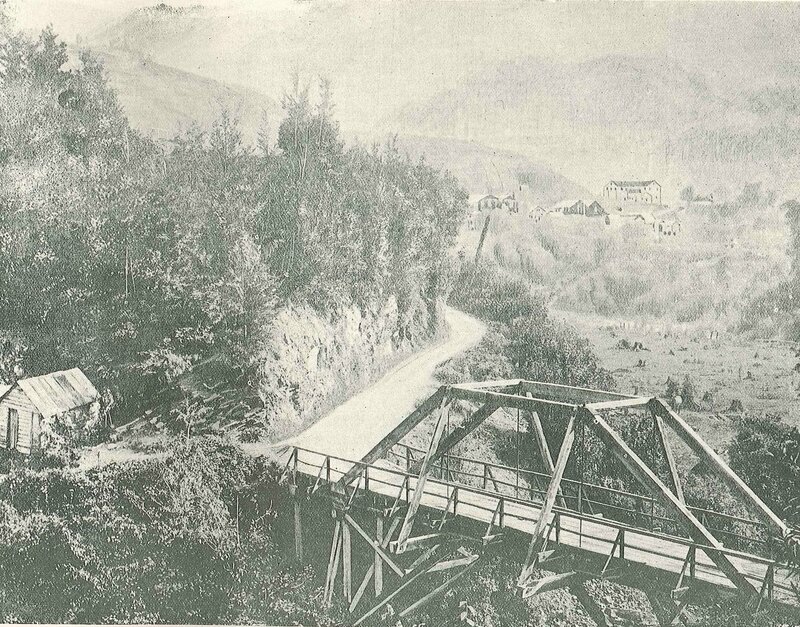 It is scarcely necessary to say that the technical work has been uncommonly well done. We compliment Messrs Wheeler upon their excellent carrying out of a well-conceived idea. 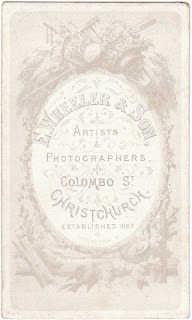 One of the most instructive, and in all probability most attractive, exhibits to be sent from Christchurch to the Indian and Colonial Exhibition at London, says the Lyttelton Times, should be the large frame of photographs prepared for the New Zealand Shipping Company, This is some 8ft long by 5ft in width, and contains twenty-four pictures, admirably taken by Messrs. Wheeler and Son. 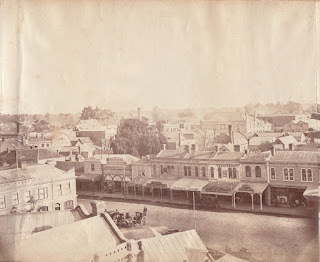 They comprise views of the principal ports of the Colony, and of some of the improvements made therein, such as the Lyttelton dock and the New Plymouth breakwater. 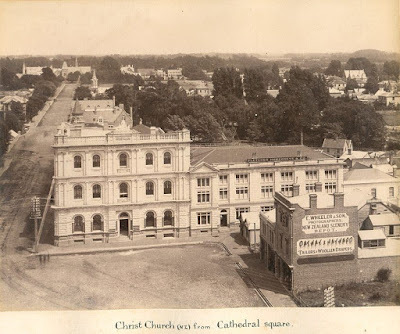 There are also photographs of Christchurch and its Cathedral. Several of the magnificent steamers of the Company are also represented at sea, at the wharf and in dock. 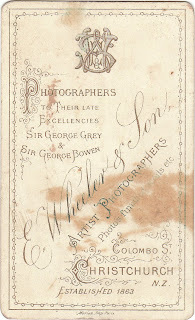 Their gorgeously decorated saloons have also been photographed for the inspection of intending passengers to the shores of New Zealand. 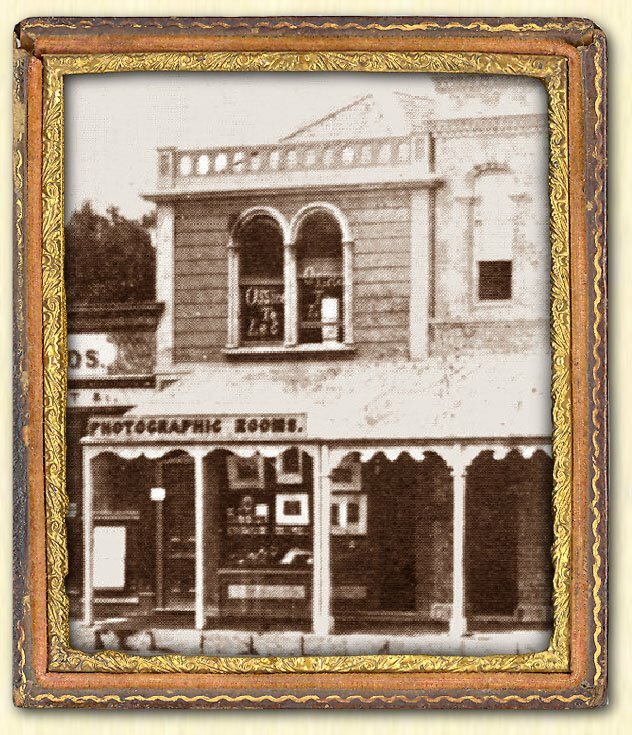 Altogether the pictures are admirably calculated to give a good idea of the harbours and towns of the Colony, and of the resources of the powerful Shipping Company which takes its name from this Colony. About one o'clock this afternoon the spectacle of half-a-dozen large tilted waggons, each drawn by six powerful horses, assembled on the western side of Cathedral square, excited a good deal of interest among the frequenters of that locality, and many were the conjectures hazarded as to what the gathering might portend. Some persons fancied it connected in some way or another with the West Coast Railway — why it is not easy to imagine, except it be for the fact that that subject is uppermost in people's minds just now, and therefore enters into all their thoughts. Others thought that the waggons represented an attempt organised on a large scale to compete with the railways already constructed. 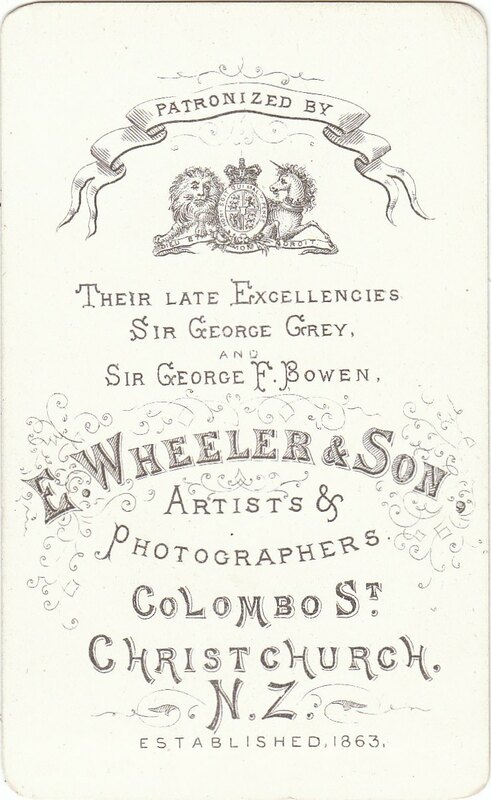 The fact was that Messrs Murray and Forbes, carriers, of Amberley, who are giving up business, had brought their waggons and teams to the square for the purpose of having them photographed by Messrs Wheeler and Son before they are offered for sale. The extreme excitement caused by the eruption of Tarawera may be measured by a little circumstance. 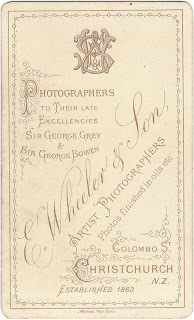 Mr Wheeler, the well-known photographer, has made prompt arrangements for sending up to the district to procure a series of views of the country affected by the new volcano. Two photographers, with an immense quantity of plate 3 and apparatus start from Christchurch to-morrow, and make their way by the quickest route to the Lake District. 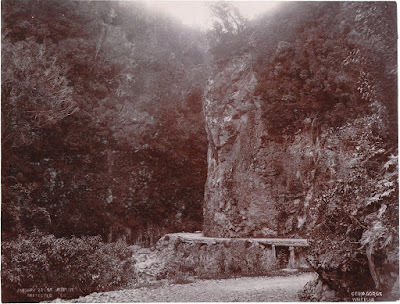 They have been instructed to take pictures of Wairoa, Tarawera, Rotorua, Rotomahana - if the famous lake is still in existence and to work through to Tauranga, photographing everything that may be of interest in connection with the late catastrophe. 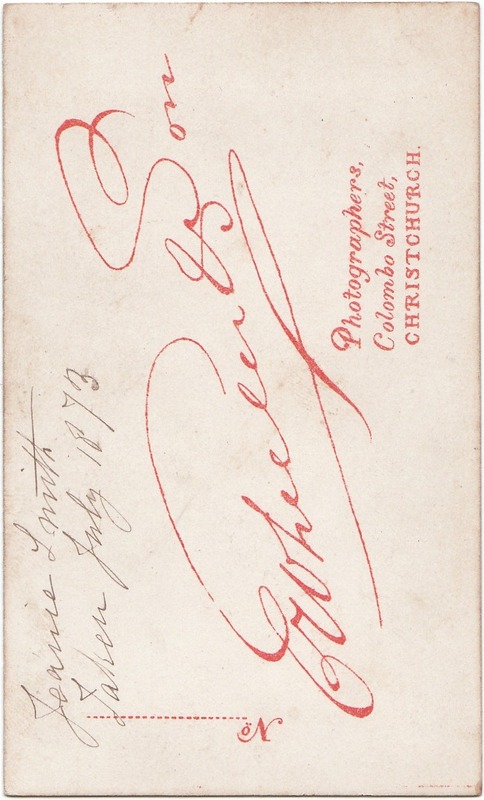 A photographer from Christchurch, named Mr Sorrell, attempted to reach, Tikatapu to-day. He managed to make the edge of the bush, when his horse stuck hard in the mud, and he had to return. It is impossible to proceed further. The mud has been washed down fully a foot. The springs are gradually getting less active. 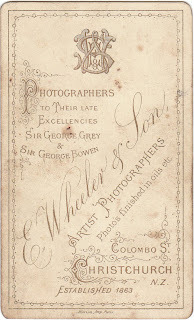 At the Golden Wedding celebration of Mr and Mrs Ollivier … The company then dispersed around the grounds, several groups, including one of a perfect galaxy of old identities and first four ship pilgrims, being photographed by Mr Wheeler, as a memento of the occasion. A Remarkable Photograph. 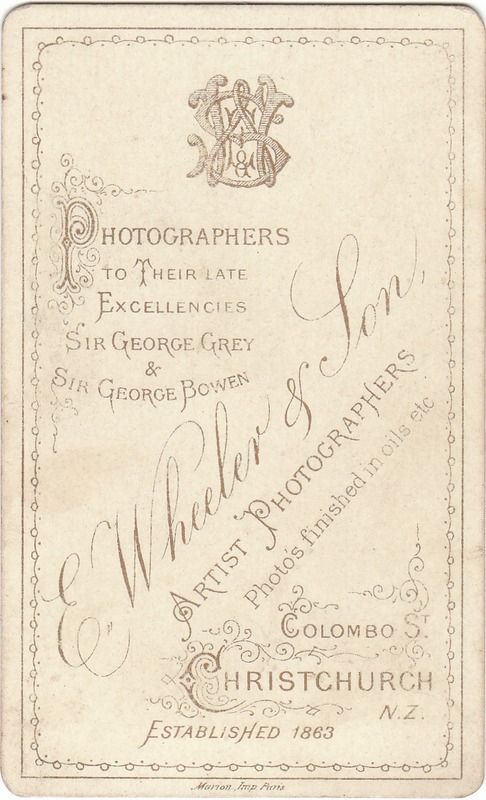 — The finest photograph (sic) of its kind we have ever seen — and that in these days of enterprise is saying a good deal — has just been produced by Messrs Wheeler and Son. 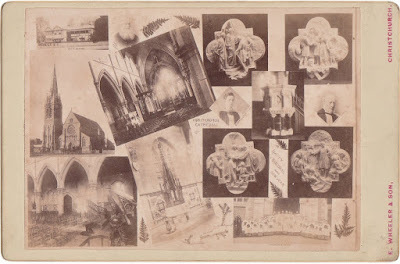 It is a comprehensive group-picture, of course an instantaneous one, of all the firemen now assembled in Christchurch, the band, and various members of the general public. The remarkable point about the picture is that although some hundreds of figures are included in it, not a single face is indistinct. 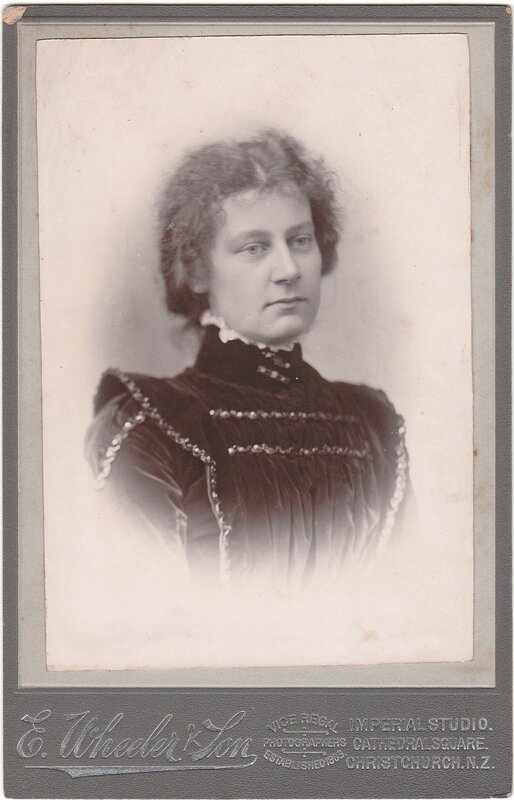 What is more, these faces are for the most part excellent portraits, recognisable at the merest glance. It is unquestionably a remarkable photograph, and to our thinking constitutes an artistic curiosity. Swallows on the Heathcote. 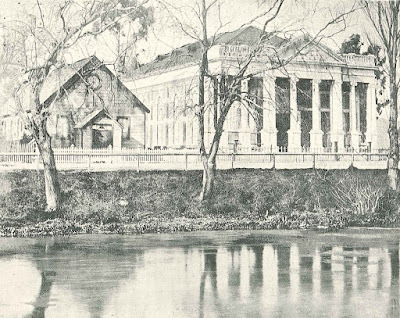 — Assuredly, it will be news to our readers that swallows are to be seen skimming along the calm surface of the river Heathcote, and that a photograph by Messrs Wheeler and Son, of Cathedral Square, is cited as authority. 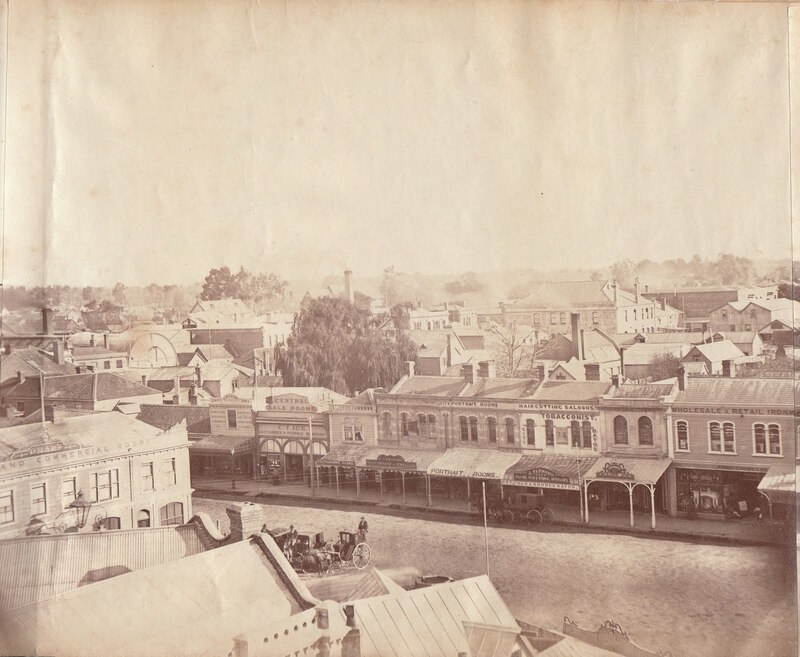 The Illustrated Australian News of April 28 contains a full-page engraving, "On the Heathcote, near Christchurch — from a photo by Wheeler and Son, Christchurch," and an uncommonly pretty picture it is. The artist, however, has evolved details "out of his inner consciousness" in the way of birds and flowers, and he happens to have made a swallow the most prominent foreground detail. 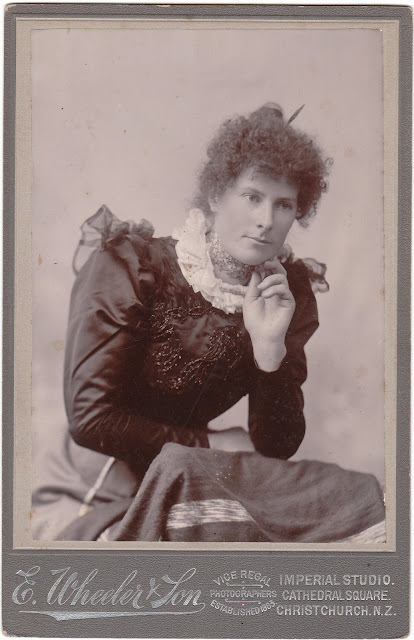 This notwithstanding, the swallow's exquisite flight and charming twitter may still be sighed for in vain. 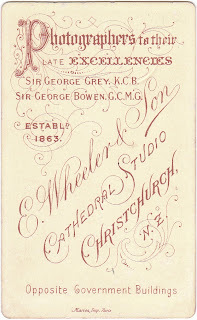 His Lordship The Bishop of Christchurch having favoured Messrs Wheeler and Son with a sitting, capital Cabinet Portraits can be had 1s each. 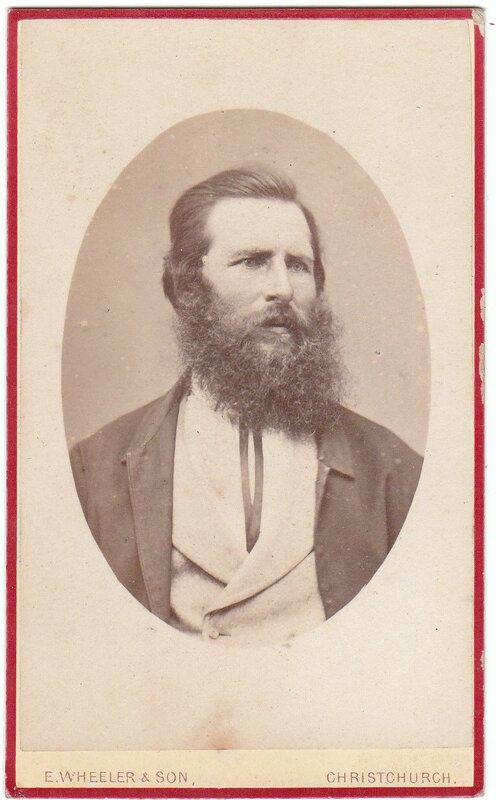 Also, Cabinets of Bishop Harper, 1s each. 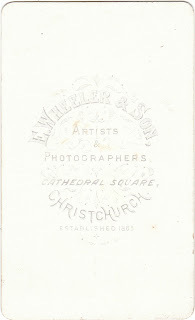 E. Wheeler & Son, Cathedral Square, Christchurch. 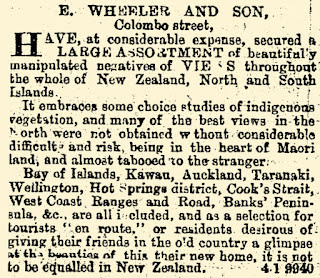 Timaru Herald, Volume L, Issue 4854, 27 May 1890, Page 1. Photographing Ostriches. 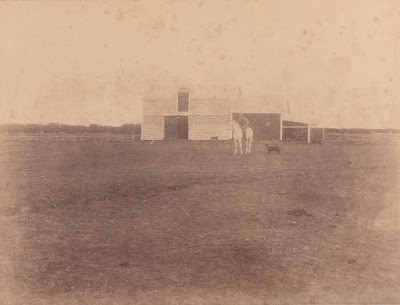 — After two days' hard work and an exercise of patience which would have daunted less determined persons than Messrs E. Wheeler and Son, that firm has succeeded in getting a really good photograph of a group of the adult ostriches as they appear on the farm at Harewood road, where they are now running. 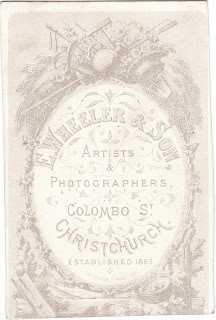 Having photographed every other known animal in New Zealand, Messrs Wheeler and Son were determined to succeed, and they have secured a capital picture. Copies are now on view at Messrs Acland, Dudley and Co.'s office, and at Messrs Wheeler and Son's studio. 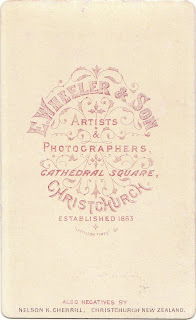 Panoramic Views.— We were this morning shown some very fine panoramic views of Christchurch, which are being published by Messrs E. Wheeler and Son. The views were taken from the Cathedral tower, and form a very handsome panorama in two series. 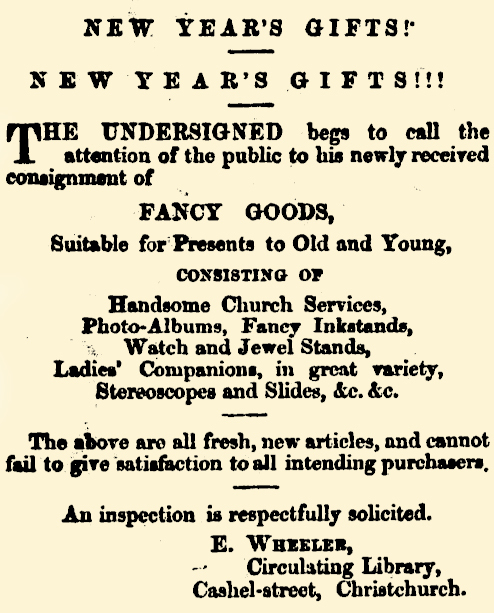 If the Person who about 2 p.m. yesterday ABSTRACTED the CASH-BOX from Desk on Mr Wheeler's Counter, containing two pounds odd shillings, and a Gold Locket with portrait inside will kindly RETURN the PORTRAIT, by post or otherwise, the said person will be doing a little towards restitution, and prevent a great deal of inconvenience, as the portrait cannot be replaced. Surely this may be expected. 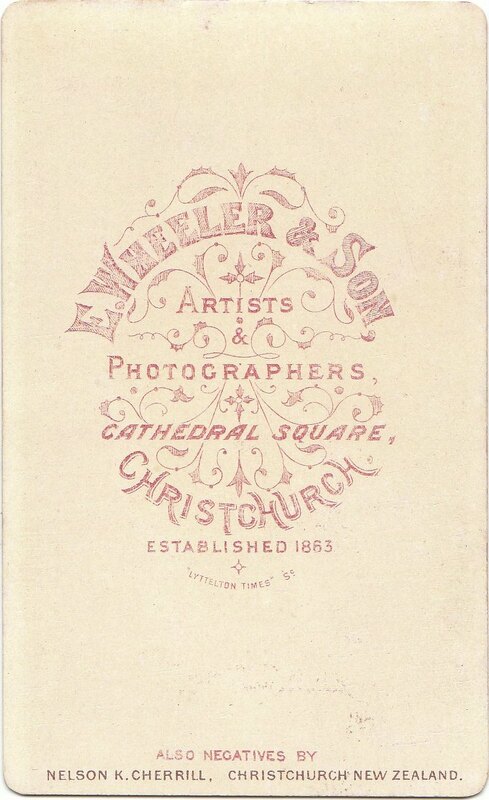 E. Wheeler and Son, Cathedral square. 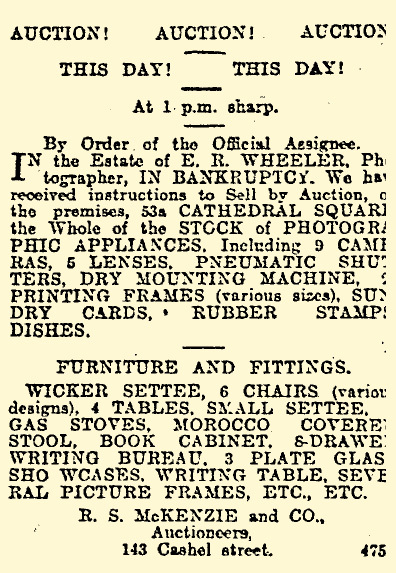 December 13th, 1898. 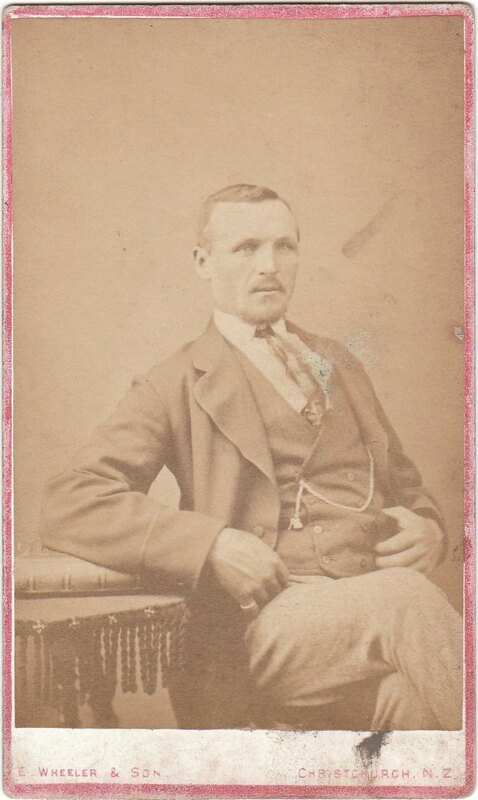 Theft.—Frederick Hulme was charged with having, on the 9th December, at Christchurch, stolen a camera value £3 10s, from the shop of George Wilson, cabinetmaker. 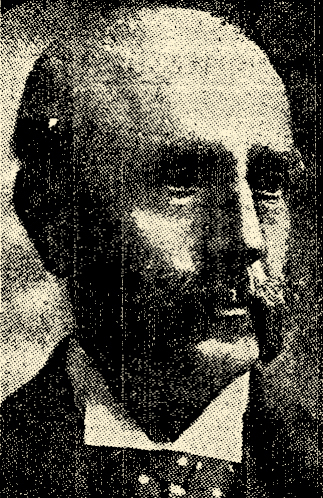 Mr Donnelly appeared for the accused, who elected to be dealt with summarily. 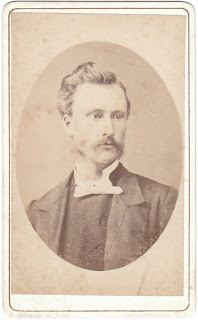 Detective Livingstone gave evidence as to arresting the accused, who then stated that he had bought the camera from a man named Williams in Sydenham, and that he had paid 15s for it. 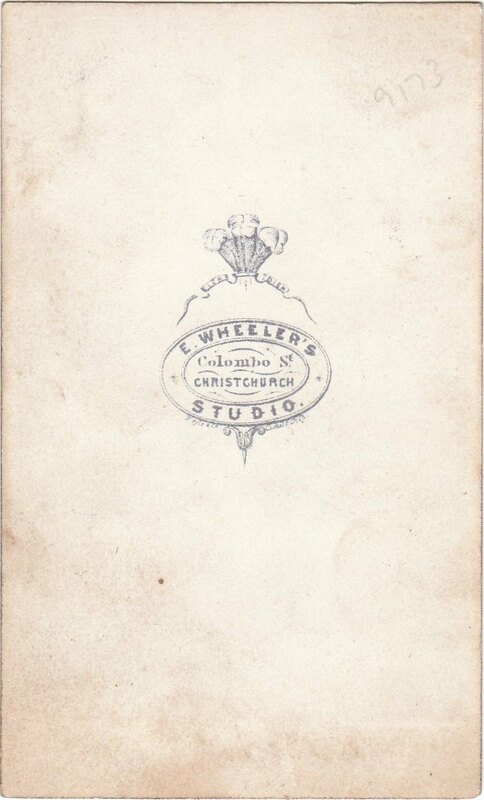 The same accused was further charged with having, on the 1st January, and the 31st December, at Christchurch stolen from Mr E. Wheeler 13¼ doz photo views, value £6 12s 6d, 24 copies "Glimpses of Australia" value £1 4s, "Imperial Albums of New Zealand Scenery," £1 14s; total £9 10s 6d. 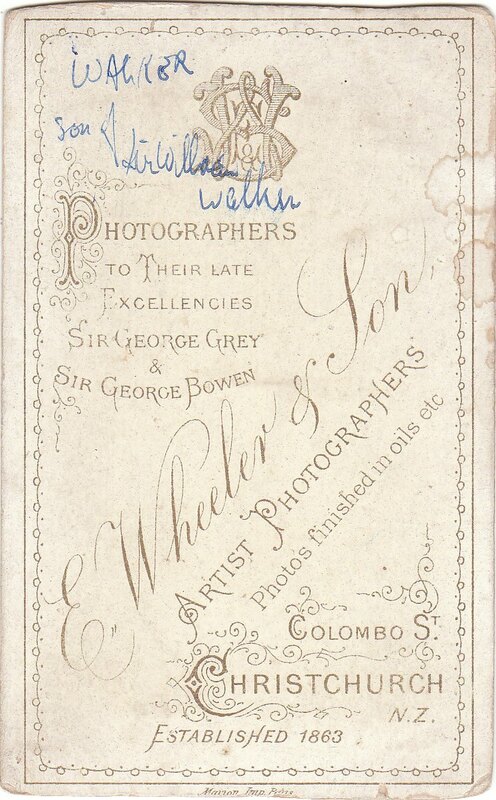 On the application of Mr Donnelly, and with the consent of Me Wheeler, this amount was reduced to £5. 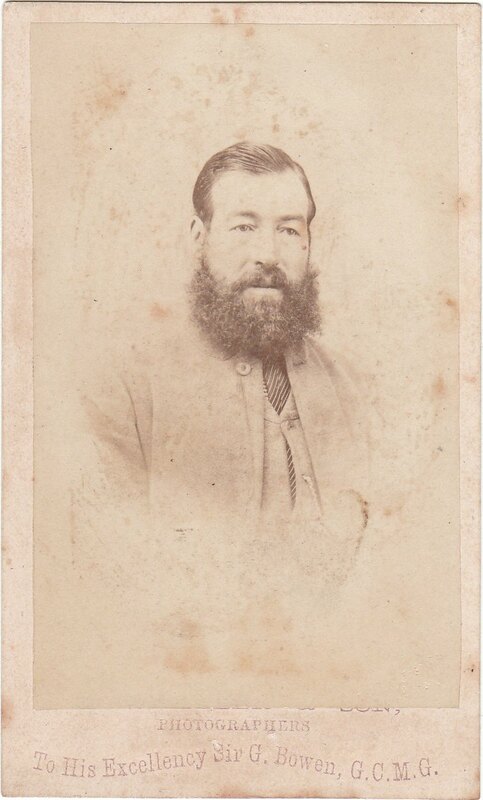 The same accused was further charged with having, on the 27th October, at Christchurch, stolen one piece of cloth, value 30s, the property of Mr J. S. Heyward. 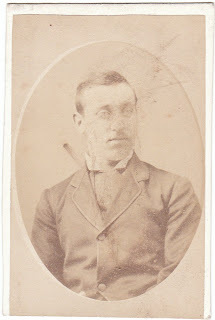 Mr Donnelly submitted that the accused should be allowed probation, as this was the first time he had appeared in any Court. His Worship was not of the same opinion, but said he would deal leniently with the accused. 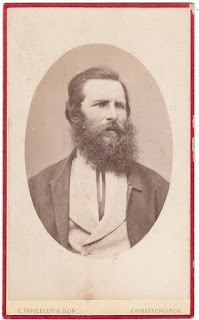 He was sentenced to one month's imprisonment on each charge, the terms to be concurrent. above - a glass slide of Cathedral Square by E. Wheeler & Son. Mr Wheeler, photographer, has presented the Tourist Office with a photograph of a trout caught in the Rakaia last December by Captain Studdy, weighing 15lb, and of a length of 28in and girth 17in. The photograph will probably be framed and hung up in the office, to show tourists the sort of sport they may expect in New Zealand waters. 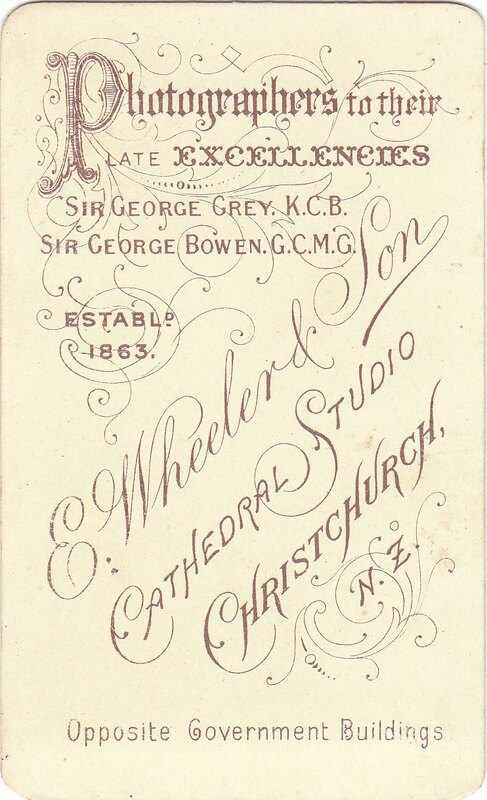 above - a post card of St Luke's Church, Christchurch by E. Wheeler and Son. 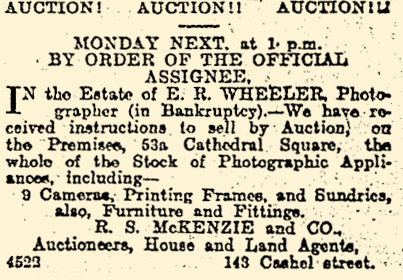 Christchurch, This Day Competition, arising out of modern improvements, was the cause given for the failure of Edmund Richard Wheeler, photographer in Cathedral-square, at the I meeting of his creditors yesterday. The bankrupt stated that he had been in business as a photographer for fifty years, and up to five or six years ago his business had been successful. During the past five years it had steadily declined. He had been engaged for the most part in photographing Now Zealand scenery, but the introduction of postcards and photo-engraving interfered with the sale of photographs, and the illustrations in weekly newspapers robbed his business of a lot of interest to the public. 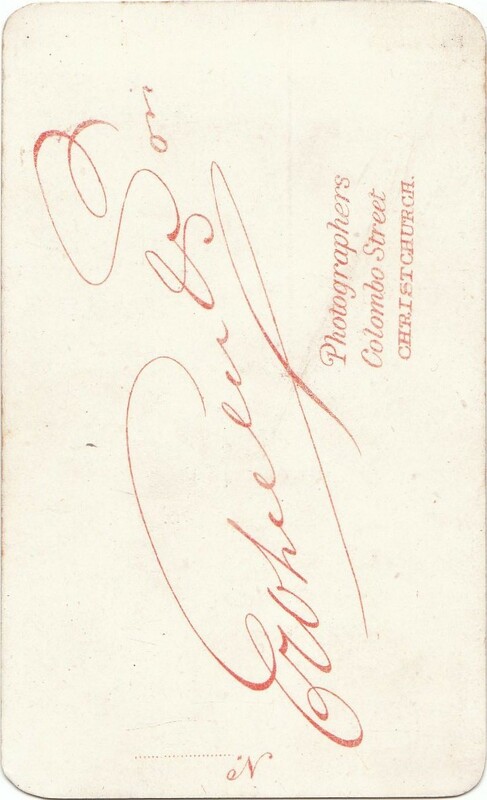 He attributed his bankruptcy to the introduction of postcards, to the facilities given by the Government Tourist Department, and to the weekly papers satisfying the public want to the detriment of his special business. Seldom in our recollection has so much sympathy been expressed with the debtor at a meeting of his creditors as was evinced yesterday in the case of Mr E. R. Wheeler, the veteran photographer, and probably never was sympathy more sincere, or better deserved. 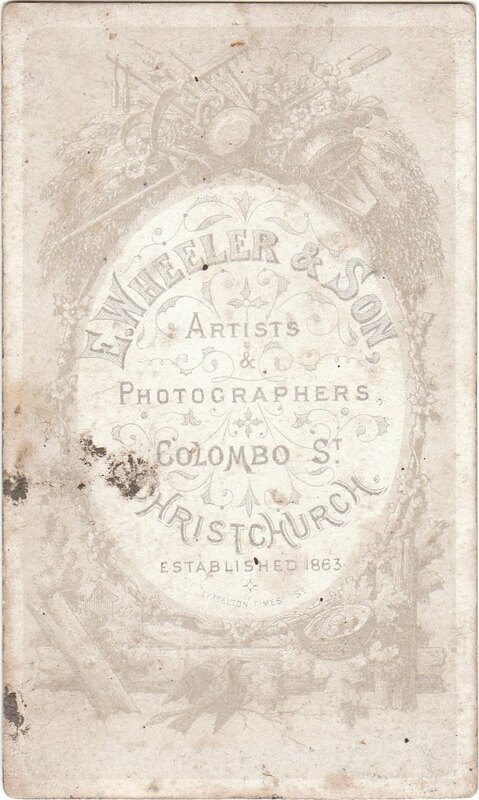 After being fifty years in business, keeping unremittingly at work, and living in a very modest manner, Mr Wheeler, whose specialty is photographing New Zealand scenery, finds himself unable to withstand the competition of picture post-cards and the illustrated papers. 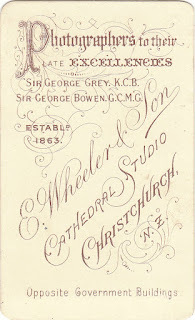 In his day, Mr Wheeler has done good work for the Dominion. 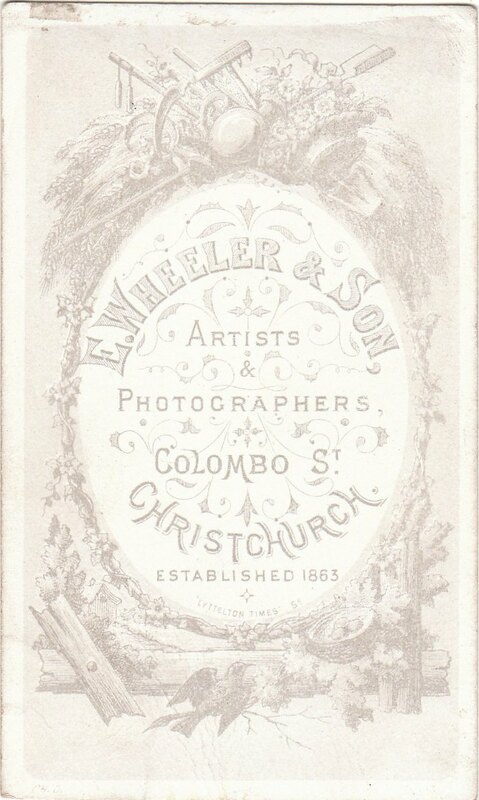 His first photographs of Mount Cook scenery, the West Coast Sounds, and other famous beauty spots, were taken when all those places were very inaccessible, and the work not only involved considerable expense, but entailed no little hardship and enterprise on the part of the operator. 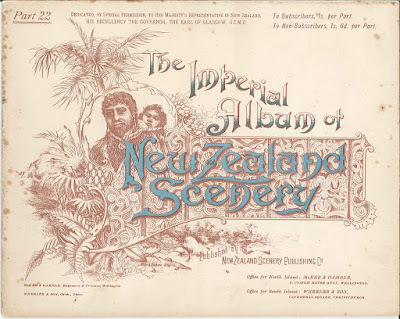 They showed great artistic excellence, and as every tourist made a point of securing a set they were the means of making known far and wide the great attractions of New Zealand as a tourist resort. 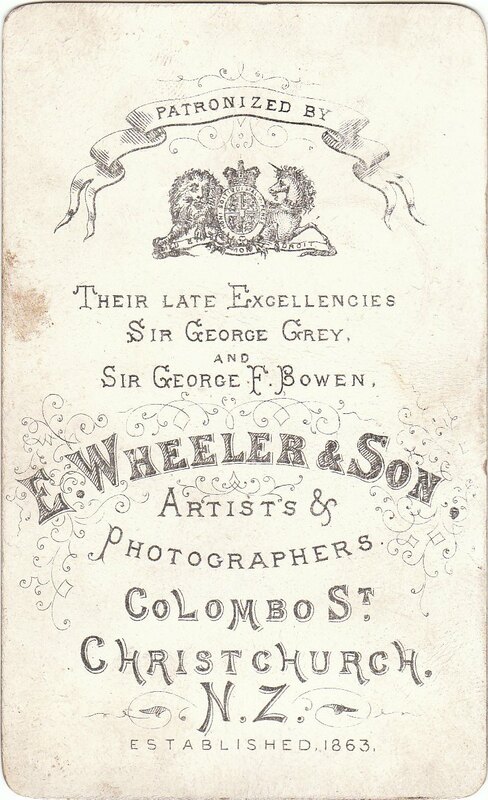 Mr Wheeler is young and vigorous for his years, and we sincerely trust that some sphere of usefulness may yet be found for him. He certainly deserves a better fate than to be allowed to fall into poverty in his declining years. Furniture Auction Sale. 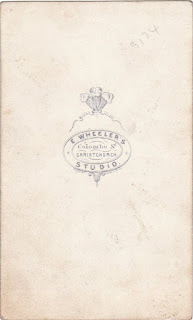 Wednesday Next, at 1 p.m. On account of Mr Wheeler, on the Premises, 404 HEREFORD STREET, LINWOOD. 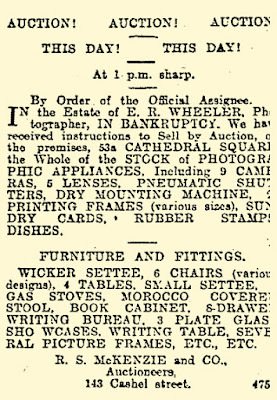 THE CONTENTS of' SIX ROOMS, Including Piano (by Tonisca, Berlin), very fine China Cupboard, Sideboard, Carpet Squares, Easy Chairs, Old Carved Chairs, Kitchen and Dining Tables, Hall Stand, Hall Chairs, Fenders, Oil Paintings, Pictures, Books, Music, Double and Single Bedsteads, Chest Drawers, Cheval Mirror, Music Stand, Mangle, Gas Stove, Crockery, Cutlery. Glassware. 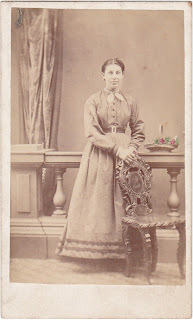 Pots and Pans, Washstands, Bedroom Wave, Couch, Hall Runner, Lino, lot Maori Curios. 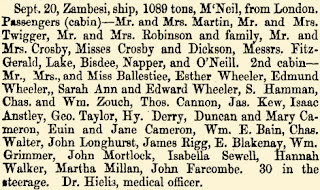 (2) The Star 4 May 1869, page 3. 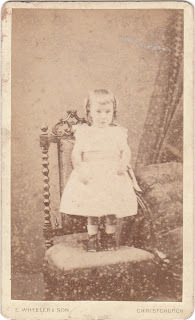 (10) "England Births and Christenings, 1538-1975," database, FamilySearch (https://familysearch.org/ark:/61903/1:1:NBM1-JXX : accessed 12 March 2016), Sarah Ann Wheeler, 19 Jul 1840; citing , reference ; FHL microfilm 817,173, 817,174, 817,175. 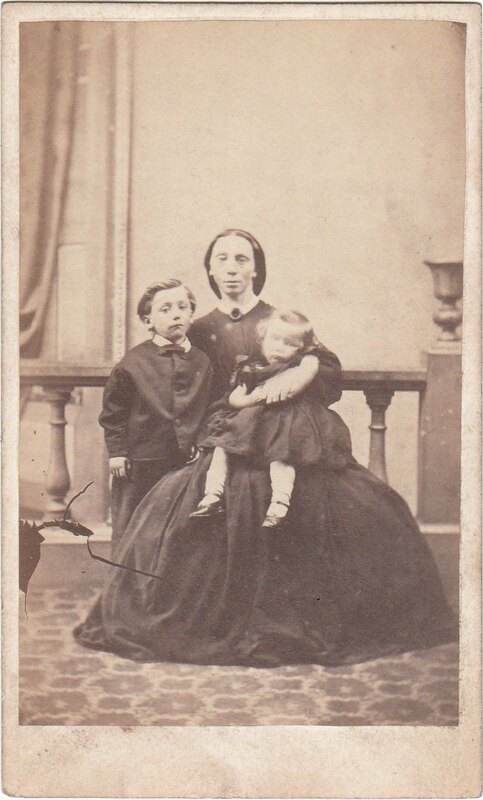 (11) "England Deaths and Burials, 1538-1991," database, FamilySearch (https://familysearch.org/ark:/61903/1:1:JHY9-5BZ : accessed 12 March 2016), Ellen Wheeler, 11 May 1845; citing , reference v 8 p 523; FHL microfilm 918,913. (12) England Marriages, 1538–1973 ," database, FamilySearch (https://familysearch.org/ark:/61903/1:1:NLWJ-9LQ : accessed 12 March 2016), Edmund Wheeler and Esther Walker, 08 Nov 1837; citing Aston Juxta Birmingham, Warwick, England, reference ; FHL microfilm 0919797-799, 0919800, 0918845-46. To the Editor of The Press. 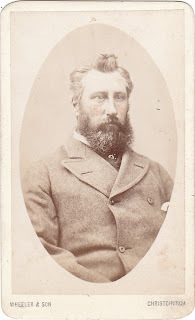 Sir, — The article in your "Topics of the Day" touching on Sir Edwin Arnold and his connection with King Edward VI. 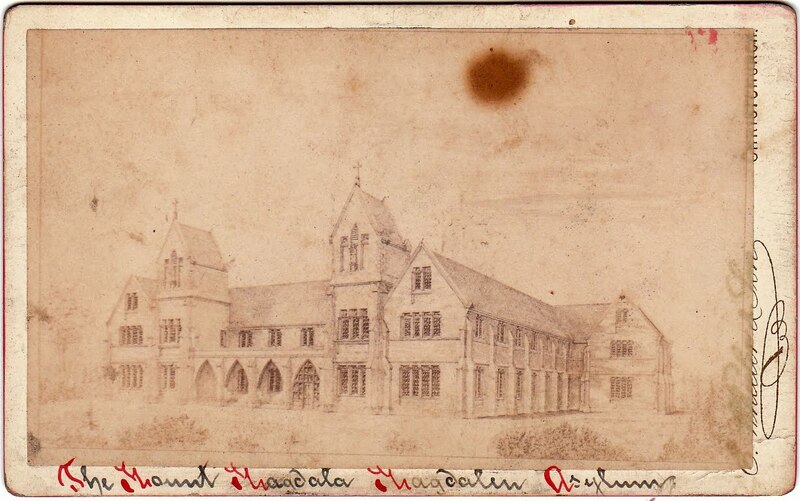 's Collegiate Grammar School, Birmingham, brings very vividly to my mind many pleasant reminiscences of the old school. 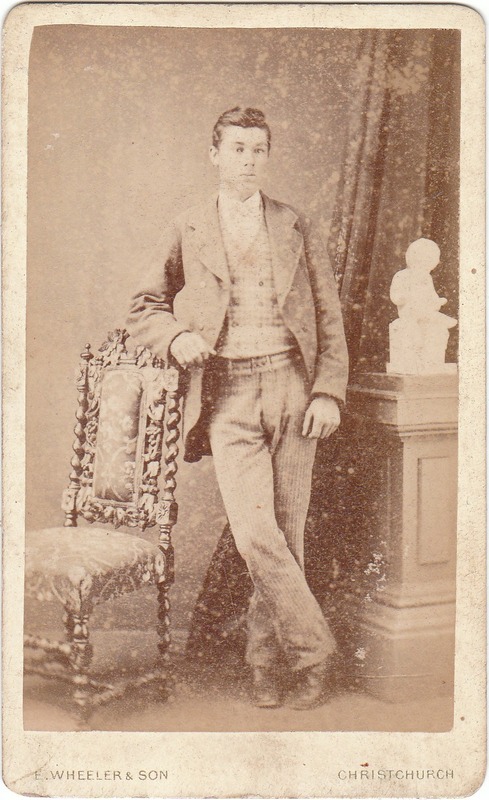 I was there when he — then plain Edwin Arnold, M.A., — occupied one of the stately Gothic master's thrones in the huge east schoolroom; when Dr. Gifford reigned as head master, and with such men as Sydney Gedge, Dr. Stephenson, Dr. Yates, and a small army of other masters looked after the thousand boys entrusted to their charge. King Edwards' with its historic and wealthy foundation and magnificent buildings occupies an unique position in the Midlands, and last year could claim an Archbishop (Dr. Benson, of Canterbury), and two contemporary Bishops among its alumni — not a bad record. 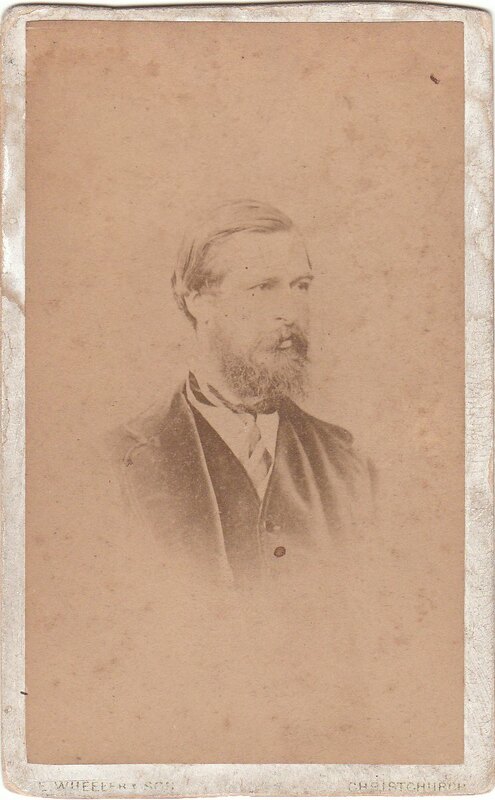 Edwin Arnold left the school on his appointment as Principal of Calcutta College, while I was there, and a pupil in one of the two classes under his especial care, and I value highly a "proxime accessit" given me by him as a sort of solatium for missing t a certain prize. He was a man of great personal charm, with a fine presence, and a peculiarly rich, full voice. 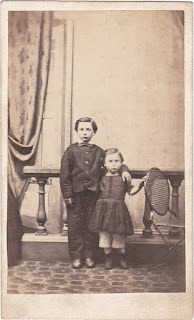 The incident of the caning I can recall, but to my then boyish mind — Ehue! 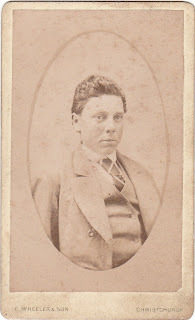 fugaces anni — and not being "Jones," it was only a curious incident, and had not the dramatic interest and significance which maturer years give to it. 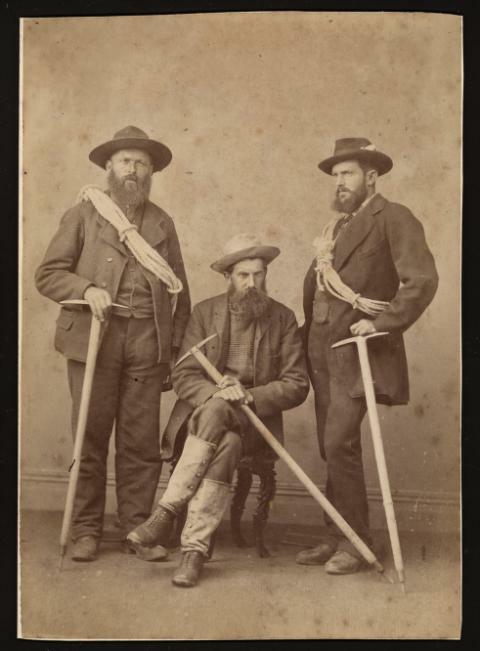 There was a chivalry about the man in his general treatment of the boys which would prompt him at once to an action of the kind, and I well know how proud the pupils of his classes were of "their master." 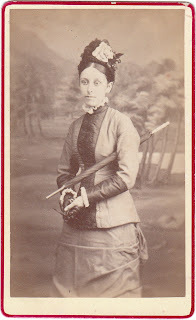 A fine artistic touch with the cane had the future author of "The Light of Asia" — no bungling with gown during the operation, but gathered well back with the left hand leaving the right unencumbered, the lethal weapon was wielded with a knowledge of anatomy peculiarly exasperating to the recipient of his favours. 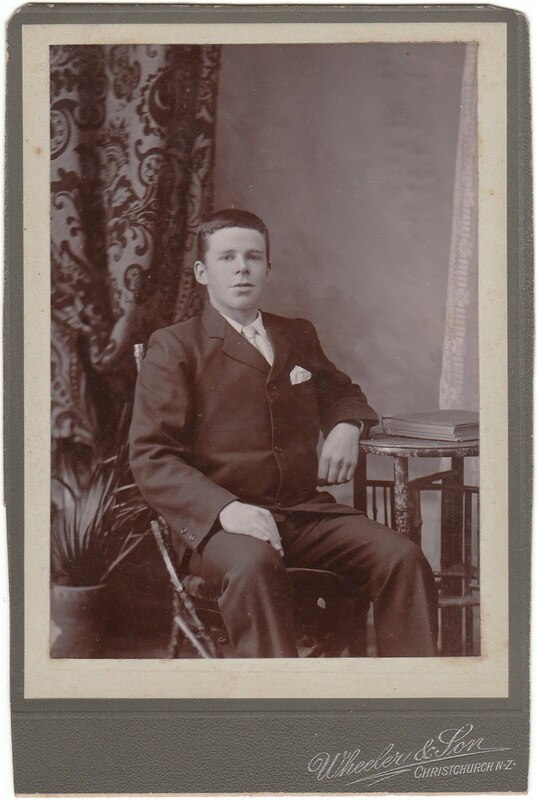 Often was I personally and deeply impressed with his thorough knowledge of the subject. 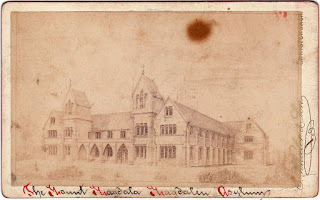 The school being one of the show places in the Midland capital, we boys were often delighted by personally conducted groups of illustrious personages — foreign and otherwise — generally in charge of the Head Master, being shown through the two large halls — classical and commercial divisions — affording us as they did not only food for our curiosity, but an excuse for a temporary cessation from tasks and opportunity for devouring the chocolate slabs so popular at the school, and difficult to negotiate under normal conditions. 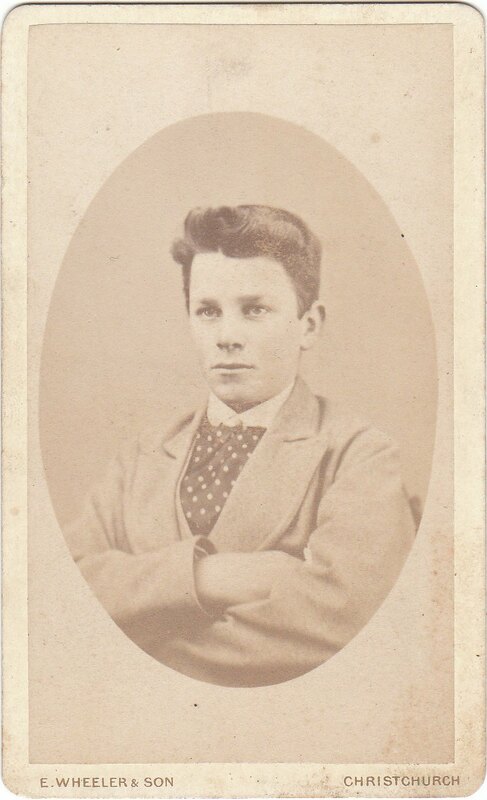 To Arnold's boys no other master had his grand air in showing round the swells, and when in sailing up the hall he would pass by and indicate his classes, the studious air assumed by us young hypocrites was, I am afraid, suspiciously overdone. 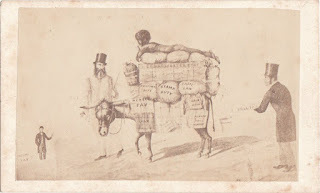 I remember a party of distinguished Orientals paying a visit to the school and taken into the playground under his guidance, and how, though they may have been Rajahs or Moguls, we voted them dirty beasts. There may have been some connection between this visit of the Orientals and Sir Edwin's later departure for the East. Ah! 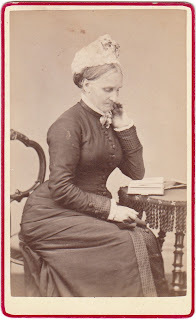 thrice happy schooldays, though we did not know it, when our sorrows, doubtless sharp while they lasted, never survived the night nor interfered with our sleep, when we could and did eat the awful contents of the the tuck-shops at all hours, and I yet enjoyed our regular meals, and dyspepsia was unknown. 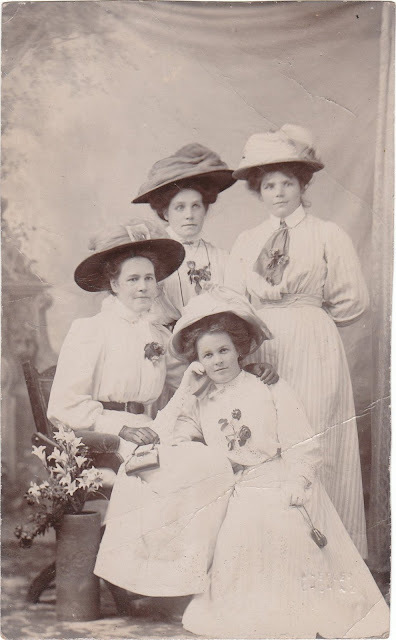 Surely those days with most of us were the sunniest in our lives? 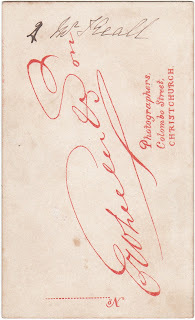 —Yours, &c, E. R. Wheeler.